The Power2Max is one of the newest crank-based power meters on the market today. Its price point is a bit lower than most other crank-based power meters, though, in the same range as rear-hub based power meters. Since the updated second generation Power2Max units became available back in September – I think the game has shifted a bit and they now offer a more competitive product than they previously did – hence my interest in reviewing it. Power2Max sent out a unit back in early summer for me to check out and evaluate. Since then, I’ve been using it constantly. In doing so, I’ve got a pretty good grasp on how the unit works and all the inside and out details. Because I want to be transparent about my reviews, as I mentioned above Power2Max sent me the unit as a trial unit. Once that period has elapsed, I will send the whole kit back to them (it’s actually already off the bike!). Simple as that. Sorta like hiking in wilderness trails – leave only footprints. If you find my review useful, you can use any of the Amazon or Clever Training links from this page to help support future reviews. Assuming you purchased the Power2Max as just the power meter itself (without cranks), then it’ll come in a rather small box. Sorta the size of a double-CD case (remember those?). Below that you’ll find an official calibration certificate of the unit, listing the BCD type, serial number, born-on date and slope – along with the torque specifications for attaching your unit. Do follow these torque values. 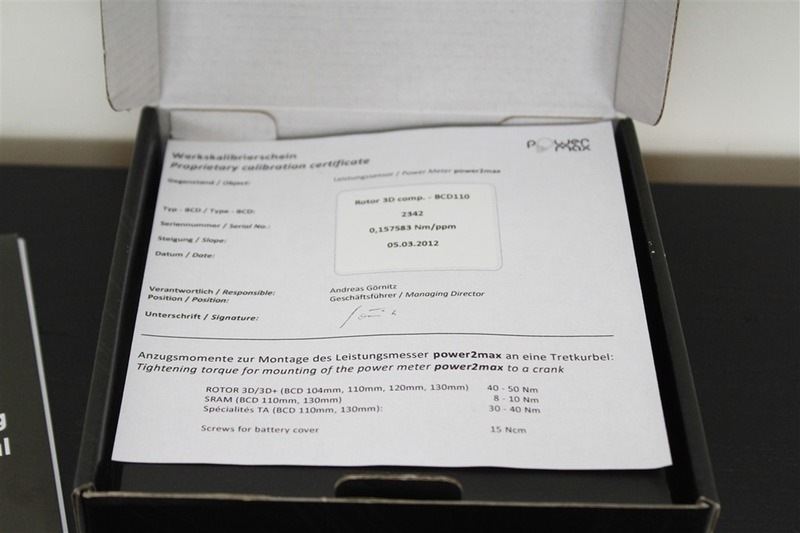 The below certificate is for the older unit (I did unboxing pics for that), but the new certificate is identical. Next you’ll see the battery hanging out below it, along with a couple extra screws. Put these in a safe place. They are extras, but I assure you in time you’ll manage to lose them off the battery cover. I lost one, somewhere, while changing the battery one day. They are incredibly small and are easy to just disappear (especially with the unit mounted to your bike). As you can see, we’ll have to add the chainrings and cranks – but we’ll do that in a minute. That triangle shaped pod is the battery and electronics compartment,you can see the three screws holding it on. Those are the same three screws that they provide two extra screws for. So it’s like baseball and strikes as far as losing screws go. Three strike and you’re out. Since it doesn’t have chainrings on, we’ll still have to take off the non-drive side crank arm, as well as as take off the battery cover to plop the chainrings on. For everyone else, let’s get this puppy all put together and installed. When it comes to installation of power meters, I’d put this in the middle range as far as complexity goes. At the easiest end is the PowerTap (already in a wheel), and at the not-so-easy end is the Ergomo. This is roughly half-way. Neither easy nor difficult for the average consumer. It’s made easier however if your bottom bracket is already the correct type. And obviously, harder if you have to swap that out. If you’re already confused in the last few lines, I’d suggest bringing a 6-pack to your local bike mechanic and calling it a night. That said, over the past 6-7 months I’ve gotten really darn good at installing this thing repeatedly. I can do it in about 10 minutes from a power meter of a different bottom bracket type, all the way to this (including swapping chainrings). But for most folks I don’t expect quite that level of efficiency on the first go. 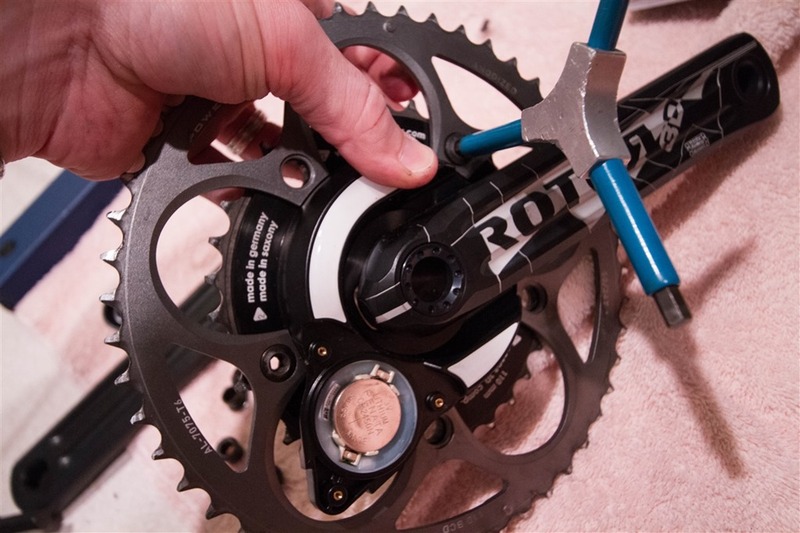 If they sent you the cranks already on it, but without chainrings, then you can just remove the battery cover and ‘snap’ the larger chainring on it without having to remove the crank (like above). Be warned, if you ever have to remove the drive-side crank-arm, it can be a solid PITA depending on how tight the person attached it. Trust me. Once it’s in there (and your chain is in there, don’t forget! ), then you’ll go ahead and attach the non-driveside crank arm. If you have a ROTOR crank as I did, be aware that the tightening bolt is a bit funky. You’ll first use a wrench to tighten the cap in place (in the photo above, the hole that would extend into the bottom bracket), and then you’ll tighten the small bolt on the side (in the photo above, the small bolt you see at the right edge of the crank arm, facing up). Note that the small bolt is not meant to come out. If you try, it’ll crack. It makes for a bad day. In general, once you’ve got everything set, I highly recommend doing a couple of trainer rides before you head outdoors. That’s my general mantra anytime I work on my own bike (I have more trust in a bike mechanic than myself). I figure if something is going to go wrong in that area of my bike, I’d much rather it be in front of my TV, than descending at 30MPH. 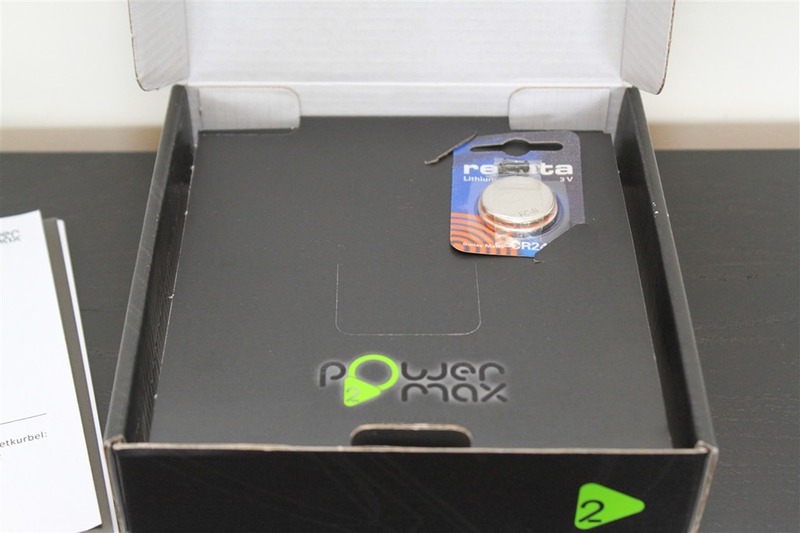 The Power2Max utilizes a Renata 2450CN coin cell user-replaceable battery. Note, I specifically called out the brand here – Renata, as I’m told that other 2450CN batteries are actually not compatible. So if you buy a small stock of batteries to have around the house, then you’ll want to ensure you get the right brand. In general, I recommend that you get a few batteries and stash one in your car or bike bag, just to have there. Much easier to buy them now, rather than when you get the low-battery condition. In any case, the battery pod is accessed via the three screws we discussed earlier. It has two o-rings to keep it weatherproofed. Interestingly, if you look carefully at that little white label, the ‘SN’ is actually the ANT+ ID – making it easy in the event you need to know your ANTID for pairing purposes (normally, you can just search, but if you were in a group setting and forgot to pair in advance then there ya go). The battery lasts 300-400 hours of active cycling time. The unit will automatically shutoff after a couple minutes of inactivity (any movement). To wake it up, simply move the crank arm and the accellerometer will turn on the unit and start broadcasting. This section will be short, since I cover much of it elsewhere in this review, and in the various head unit reviews. The Power2Max uses ANT+, and thus, an ANT+ head unit is required. The major choices come from Garmin, Timex, CycleOps (Saris), O-Synce and a handful of others. On the phone front, you can use some Android phones that includes ANT+, as well as an iPhone with the Wahoo Fitness ANT+ adapter. After which, you’ll commence a search for nearby ANT+ power meters. 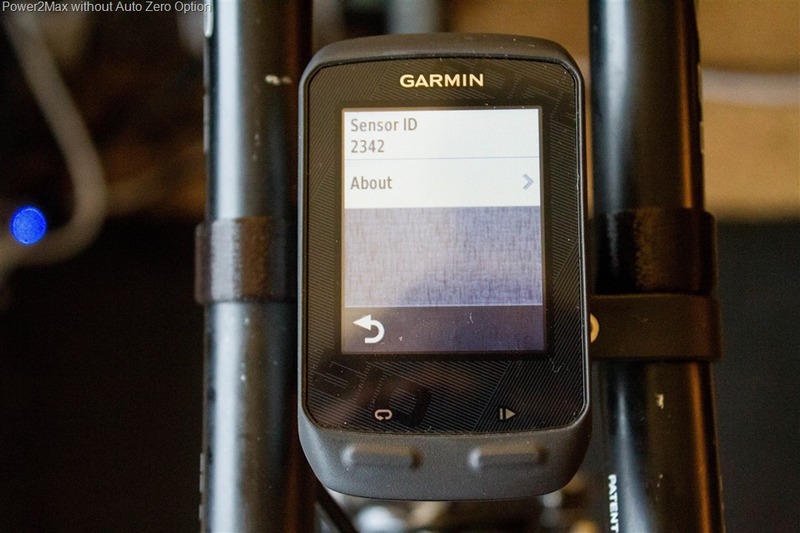 You only need to do this once, and it’ll remember the data for any future rides. Just be sure to do this with no other bikes with power meters around you. In other words, a group ride is not the time to do an initial pairing. Once that’s completed, you’ll want to complete an initial manual calibration, per the next section. The Power2Max supports a few different calibration and accuracy related options and features. One of these is new to models produced after September 2012 (temperature correction). But the rest are common across all Power2Max units. First, it supports auto zero. Auto zero means the unit is automatically calibrating itself at specified points in time. In the case of the Power2Max, this is anytime you stop pedaling for two seconds. There is no end-user notification that this has (or hasn’t) occurred however, nor can you turn it off. Functionally, this is no different than pressing the ‘calibrate’ button. 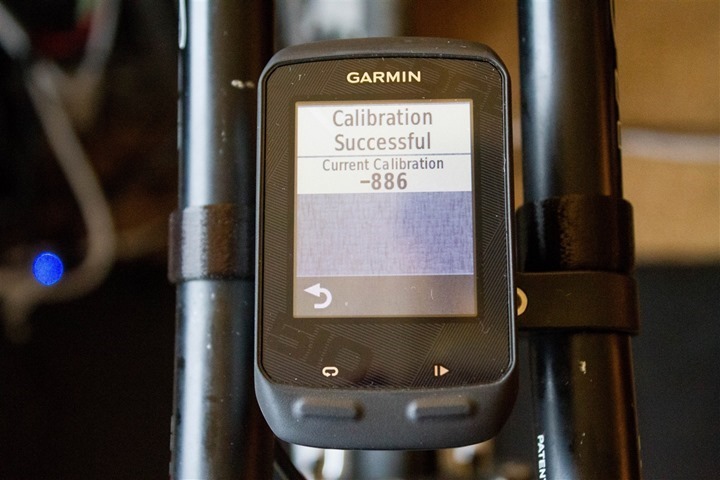 In addition to auto-zero, you can also manually calibrate the unit at any time by going into the settings on your bike computer (they’ll all differ slightly), and press calibrate. Note that you need to have stopped pedaling to do so. If you’re pedaling, then the unit will produce an error. Finally, one new feature in the second generation Power2Max units (those made after September 2012) is temperature correction. This is quite frankly the singular reason why the Power2Max went from being ‘so-so’ to ‘perfectly fine’. Prior to this, many users would see ‘drift’ of numbers over the course of a given ride due to shifts in temperature (in many cases upwards of 40 watts!). For example, starting at 8AM the temperature might be 45*F, and then at 12PM it could be 65*F. Within that timeframe as the temperature rose, the strain gauges were being impacted by the temperature change but not updated accordingly. Based on what I’ve seen, along with what many others have seen over the last few months – this change seems to have resolved these issues. Cadence is how quickly the crank arm is rotating, typically displayed in Revolutions Per Minute (RPM). In general, most people tend to have cadences in the 80-95RPM range. There’s a whole religious battle around cadence and where the most appropriate place to be (or not to be) is. I won’t get into that. That’s all training stuff and nothing to do with the product. Instead, I’ll simply note how it works here in relation to the Power2Max. As one who does a LOT of cadence related drills, I can say that the cadence here appears pretty spot-on with a standard cadence magnet setup (either in a power meter or in a separate sensor). There’s a tiny bit of a delay compared to a standard cadence magnet, but not terribly noticeable if you didn’t otherwise know. In addition to the temperature compensation, the Power2Max second generation units have introduced power balance information. The goal of power balance is to emulate Left/Right power (as in, from your left leg and right leg). The unit does this by measuring the power output of the stroke across two sections (both on the right side however). The first half of the stroke is measured from 12PM to 6PM (as if looking at the crank from the side with the chain rings), and the second half of the stroke is measured from 6PM to 12AM. Normally this is referred to as the down stroke and upstroke. For most cyclists, they will exert the vast majority of their power output during the down stroke (first half), while pressing down. During the second half of the stroke, the left leg would then be on the down stroke (since pedals are oppositely arranged/connected). Thus, the Powr2Max makes the assumption that power outputted during the second half of the stroke is actually coming from the left leg. To help illustrate this a bit, I’ve taken the crank and divided it up into the two sections. When the pedal is within the first section (down stroke), it’ll report the power exerted as right-driven. While in the second section (up stroke), it’ll report the power as left-driven. The indirect left/right power measurement and estimation is most noticeable in a simple one-legged drill. In this case, I would alternate between my left leg and right leg for 30 seconds at a time, whereby I would entirely remove my non-primary cleat from the pedals entirely (meaning I unclipped and let it rest on the back of the trainer). You can see that despite being fully on a single leg, the Power2Max will report that I’m closer to about 80-90% of one leg, rather than 100%. Whereas as a pedal-based power meter will report 100% or 0%. If I really focused on the upstroke, I could actually increase the right power even further (incorrectly). Conversely, if I attempted to remove all of the upstroke, then it would get much closer to zero. However, that would somewhat defeat the point of the drill (and make it more difficult to pedal). But, the general point here shows that it’s not a foolproof system. Which, gets to the deciding on the exact value of power balance. Like even true Left/Right power (such as on the Polar/Look Keo system), there exists very little guidance on what or how it’s best used in a specific training setting. There exists many thoughts on how some of the specific pedal based power meters could be used by changing cleat position to increase power output, but very little is out there today on how to truly use left/right power data. In many ways, it’s being looked at like cadence – that ultimately self-selected cadence may be the most appropriate option for most riders. I do think that over time, there will be better research in how exactly to use left/right power data to increase cycling fitness, but even once those recommendations are made – the ‘estimation’ factor of the current Power2Max implementation would likely mean that they wouldn’t be realistic to utilize it in a left/right setting due to the lack of accuracy in the estimation method (assumption of no residual power). In fact, even Power2Max themselves says there’s little value in it other than from a marketing standpoint (quote at Eurobikethis year). That all said, here’s how the data shows up on the head unit. First, the Power2Max actually doesn’t transmit true left/right information directly to your head unit. Instead, it transmits total power, and right % of power – per the established standards on how to transmit power balance information. Then, the head unit (according to ANT+ specifications) will go ahead and determine the left power percentage and wattage. Simple grade school math for the most part. Once that’s done, you’ll see it display on your head unit. Today, supported units includes the Garmin Edge 500/510/800/810, Garmin Forerunner 910XT, and the Joule GPS. Below, you can see me having Lap Balance configured, as well as Average Balance. Outside you can see the same thing, along with a rare occasion where my balance was spot-on. Very rare. It is relatively easy to shift your balance and get them to line up – but again, there’s just little value in doing so. When it comes time to display the data on sites, different platforms show it differently. For the sake of keeping this simple, I’m just going to use Garmin Connect. Below, you can see my power balance data as displayed on the chart. You can see that according to this particular ride, I was more right-leg heavy than left-leg. This same information is displayed along the left side as well. For example, you can see the Left/Right balance shown at 47/53%. As I said before, balance information is an interesting bit of trivia, but it’s not super-useful except for scenarios of recovering from an injury in one leg and the distortion between the legs is so vast that it becomes immediately clear in the balance information. I often note that there are few things I despise more than doing in-depth power meter accuracy tests. Primarily because it’s excruciatingly difficult to do correctly (especially in a non-lab environment), and because nobody is ever happy with how you executed the test. 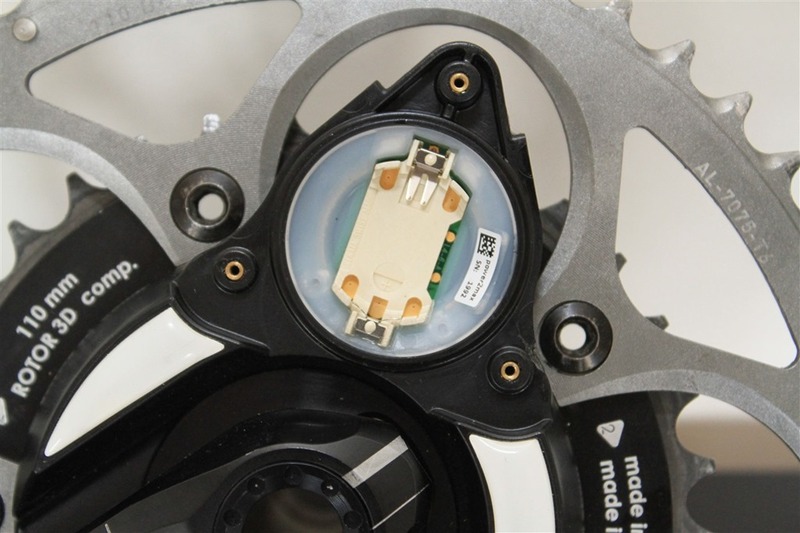 The reason being that you have to correlate multiple power meter files from multiple head units, and hope that all head units operated properly every time. No skips, jumps, crashes, or other funkiness. For example – are all units installed correctly? Are all units calibrated (correctly) at the start of the ride? Are they re-calibrated and/or zero offset updated at some point after the unit warms up? Are they all started at exactly the same time? Same recording rates? Do any units auto-pause (like the Joule) once started? If you stop mid-ride, are they all stopped at the same time? How is change in weather or temperature affecting it? Hence you can see why virtually everyone that does detailed power meter comparison tests does so indoors and in a lab environment where the rider is typically given a set timeframe to ride and all devices can be monitored by a 3rd party concurrently. That said, I’ve done some basic comparisons. I’ve had the Power2Max on my bike since earlier this summer, and then swapped it again a few months ago with the new unit. All of the data you see here is using the new Power2Max unit with the temperature compensation. 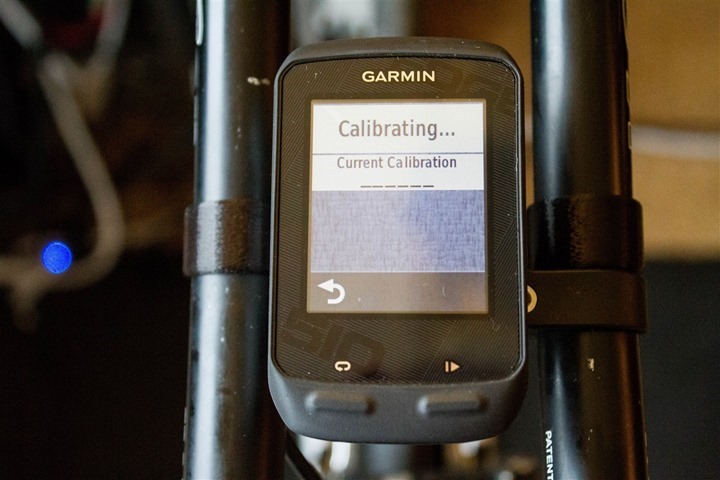 These tests each compare it against other power meters or trainers, both inside and out. I don’t however make any claim that one is more accurate than other because quite frankly there’s no way I could know that. In general, I’m simply noting that the data ‘is what it is’. Make sense? As a general rule, all units are manually calibrated at the start of the the ride, and then typically again about 10 minutes into the ride. From there, I let each units internal technologies deal with correction/compensation. Note that I am working with some folks to standardize these tests going forward, likely for reviews starting in February. This was a pretty standard slightly less than one hour trainer ride. It included a variety of drills and different segments from low cadence to high cadence. As you can see, all three units tracked incredibly closely. There was very little variation, with the low-cadence work being the one area we saw a tiny bit more variant than normal – but still within 2.7% of each other – or less than the difference between the two units when it comes to claimed accuracy (overlapping). This ride was more in line with a standard ride for me outdoors. It started out just before dawn and then lasted until after sunrise. It’s interesting in that the temperature changed a bit during the ride – which makes the data more relevant to the Power2Max temperature compensation aspects. Now, there does appear to be some difference there – especially in the first section. However, keep in mind that that first section had a number of stops/starts in it, which may represent slightly different handling of quick changes in power. As you’ll note, the PowerTap is reading slightly higher than the Power2Max (normally it would be the other way around). However, at 192.9w, +/- 1.5% would mean on the low end 190w, and the Power2Max at +/- 2% would mean on the high end 190.5w. In other words, they are both within the margin of error of being pretty darn close. No way of knowing who is more correct. Here’s a comparison chart of units on the market today that I have reviewed or otherwise ridden. Note that I don’t include units that I haven’t used in there, since it seems silly to include ones that I can’t provide direct feedback on. I do however (based on popular requests for other products) include units that are pending shortly, in those cases, I’ve put a TBA/TBD in the data fields as appropriate. Note that the below chart is updated dynamically in real-time from a database, with the most recent update listed at the bottom. If products are updated (such as a firmware release), you’ll see the table update. Finally, you can click to expand the table and get a whole lot more info. It’s just a page size limitation thing. All good? Good. Again, remember you can expand the table to see more info, and then mix and match the power meters as you see fit. Or you can do the same over at the product comparison tool. The reality is that power meter selection is a highly religious thing for many. If you visit this post in a few days/weeks/months, – you’ll likely see that in the comments. Everyone who buys their power meter swears by it – and believes it can do no wrong. This is true whether they spend well over $2-3K for an SRM, or a couple hundred dollars for a iBike. There’s nothing wrong with believing your purchase was the correct one. The challenge is that people from both extremes attempt to make product purchasing decisions about individuals other than themselves. The reality is that people purchase things at different price points for different reasons. Some will spend $2-3K for a power meter because it fits their use case perfectly, while others are fine with compromises by saving $1-2K. There are tradeoffs, and the fact is that some of those tradeoffs are accuracy, and some of those tradeoffs involve money. And some involve configuration options. It’s up to you to decide what’s most important…to you. I found for my training over the last 6-7 months, the Power2Max was sufficient for my needs. I was able to both train and race based on it, and had no problems doing either. At the end of the day, that’s pretty much where I sit when it comes to power meters. Can the unit produce data that I (me) can train by, and can I then execute on that data in a race situation? Further, is the unit easy to use on a day to day basis, and does it offer a hassle-free experience? In both cases, I can say it does (for me). From a functionality standpoint, the temperature compensation in the new units is critical. I probably wouldn’t buy an older used Power2Max due to it (primarily from the standpoint of historical data potentially being skewed). Though, as I note below you could buy an older unit and upgrade it. The newer Power2Max units all have it in place today (and at the same price as the older units). I don’t find any real training or racing value in the left/right metrics (especially being estimates), so I wouldn’t personally choose this unit over others because of that functionality. As I noted above, there is very little that a lot of smart folks in the power meter world have been able to do with those metrics to date. One minor note, Power2Max has announced they they offer upgrades for existing owners for $50US/€50. This includes both the left/right power additions as well as the temperature compensation. If for some reason you just want left/right power, that’s $10US/€10. Note that you will have to send it in to your respect distributor (wherever you bought it from). Here’s a quick table of the pros and cons of the Power2Max Power Meter. Finally, I’ve written up a ton of helpful guides around using most of the major fitness devices, which you may find useful in getting started with the devices. These guides are all listed in the ‘How-to’ section. Enjoy! Thanks for this Ray – have been waiting on this one for a while before pulling the trigger on a PM. One quick question – if I have a P2M and the GSC10 on the bike where will cadence get pulled from? Given that the P2M does do cadence (but with the slight delay you mentioned) the ideal would be that the cadence from the GSC10 overrides the P2M but I suspect that this won’t be the case …. For hub based power meters, cadence will come from the GSC-10, but for crank-based power meters it’ll come from the crank-based power meters. At least on a Garmin, other units can handle it differently. IN fact, I think offhand the CycleOps units you can set which one you want it to come from. Actually, my ANT+ speed/cadence sensor’s cadence overrides the Power2Max one. I don’t like to P2M cadence delay and I’m glad it works this way. Your summary – very wise!!! One of the reasons why I stopped following forum discussions is exactly the tendancy of a part ot the users to beat each other up. Comments from being aggressive to cynicla to just insulting. Nice! On the “cons” I’d have added that it’s heavier than the Quarq’s, for example. On the “pros” the accelerometer based cadence in theory should work better. Magnet-based cadence can produce only pedal stroke averages, and need to assume a certain synchronization between cadence and torque. It’s theoretically possible to apply torque at zero cadence, then cadence at zero torque, have positive averages on both yet an average power at zero. 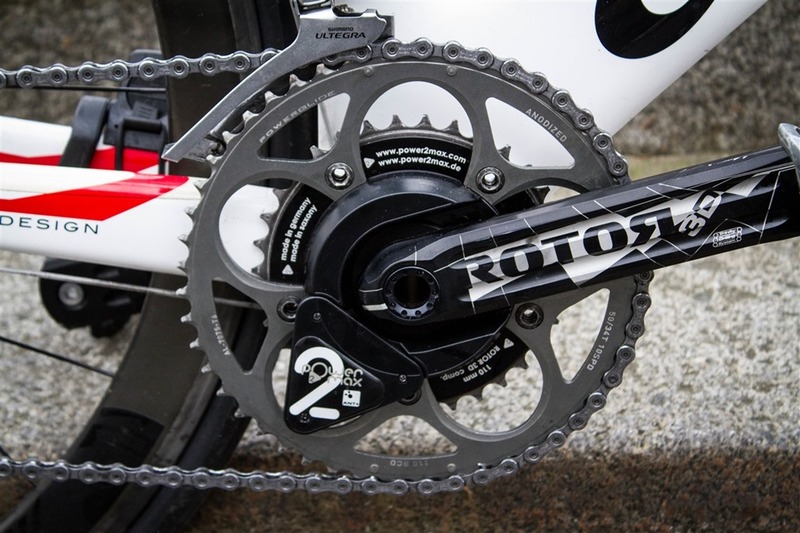 Quarq and SRM would report positive power, while Power2Max in theory will report zero. Powertap of course doesn’t need to know about cadence. But there’s theory and practice, and I don’t know how well Power2Max handles cadence data, although it has its own accuracy issues Overall, though, it appears the temperature compensation works well now, the gross anomalies from your earliest tests (and of others) are basically gone, and now it is a useful tool, even if it is on the heavy side (from what I’ve seen). whoops — I meant “Powertap has its own accuracy issues”. The simplest way to check cadence accuracy and precision is to compare the gear ratio from your chain rings and cogs with the calculated gear ratio given speed, wheel diameter, and cadence. 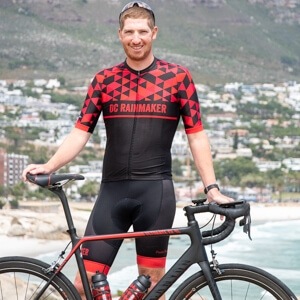 If cadence is zero, then power must be zero irrespective of how hard you are pushing – if it ain’t moving you are doing no work and no SRM or Quarq reports any power if there’s no cadence. Easy to check – when doing a static calibration test and the rear wheel is locked in place (and hence cranks cannot rotate forwards) and you apply some force to the cranks, the meters will report zero watts. Likewise if torque is zero then power is zero irrespective of how fast cranks are moving. e.g. 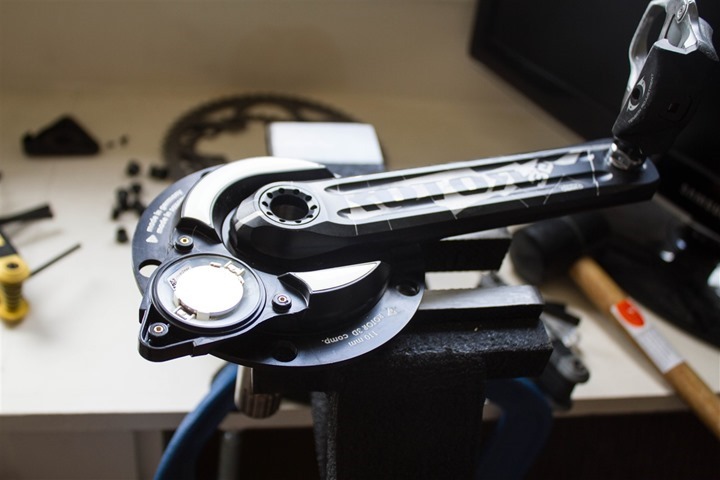 take the chain off the chain rings, spin up the cranks and let them freely rotate – the power meter will show cadence but report zero watts (provided torque zero offset has been correctly set). I’d say an accelerometer may provide additional information about crank rotational speed during a pedal stroke, but it’s not clear whether it actually does, and if it does how accurately it may be able to do that and how finely sampled. It’s also not clear to me whether the power calculated by a P2M is the result of integrating small samples of torque x crank speed around the pedal stroke, or simply doing the same as other crank based meters and multiplying average torque and average rotational speed per pedal stroke. and thanks Ray for the reviews. If you’re pushing you’re still doing work, it just may not be converted to kinetic energy; the meter is reliant upon kinetic conversion to ascertain a reading. YOU may be “working” (burning food calories if you’re pushing with your hand of leg) but you would not be burning calories if you were only standing (like a dead weight) on it. Thanks for the great review. Any insights on when/if P2M will have US distribution on Amazon, brick & mortar, or some other channel? They have US distribution their a Canadian retailer, who covers all of North America. I’m not sure if they plan to expand beyond that distributor. Thank you for a thorough review. Very very welcome. My lingering doubt regarding p2m is in respect to calibration of the slope — quarqs are obviously very sensitive to the overall stiffness of the system, and chainrings can differ by up to ~10% between them. I’ve queried P2M about this, and they insist they do not suffer from this but have not been able to detail what design difference might explain how they avoid it. Do you know anything about this? 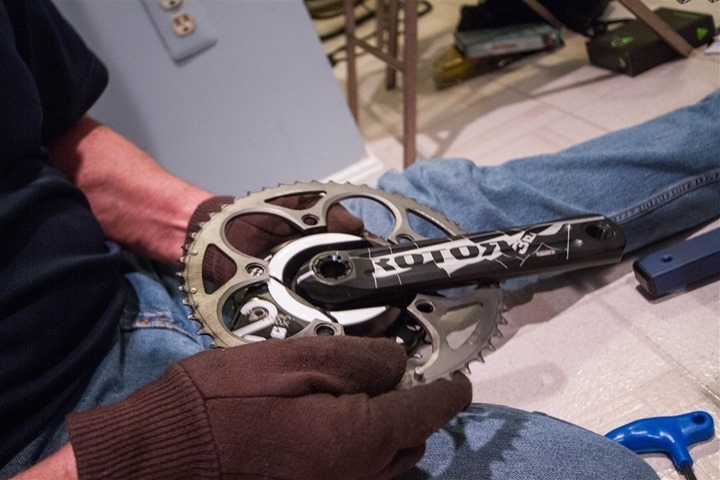 Were you able to test the meter with different chainrings to verify if the output is stable? As someone else said, I like that they use an accelorometer for the cadence. This in theory explains why they might retain accuracy for non-round rings (which again they claim to do). This is one strength of the system – in that you don’t need to send it back in after changing chainrings (valid to add to my Pros). In my case, I didn’t test multiple chainrings, but they didn’t know what I was putting on it either (I just took them off my Quarq). I picked up a G3 wheel set before X-mas for $1k, very happy with it. The thoughts I had is that a crank based meter is harder to move from bike to bike. A G3-rear wheel can be fitted with a disc for $100 and makes a fine race wheel (though I race on “normal” wheels anyhow). Nice review Ray. I’ve pretty much given up on Garmin providing a product this year considering the silence at CES. The power2max is looks solid, but I’m really interested in the Stage One option. Are you planning on reviewing that unit as well? Really disappointed in the power “balance” approach these cranks (as well as the new ones just announced by Quark) are using. It feels more like a marketing ploy. 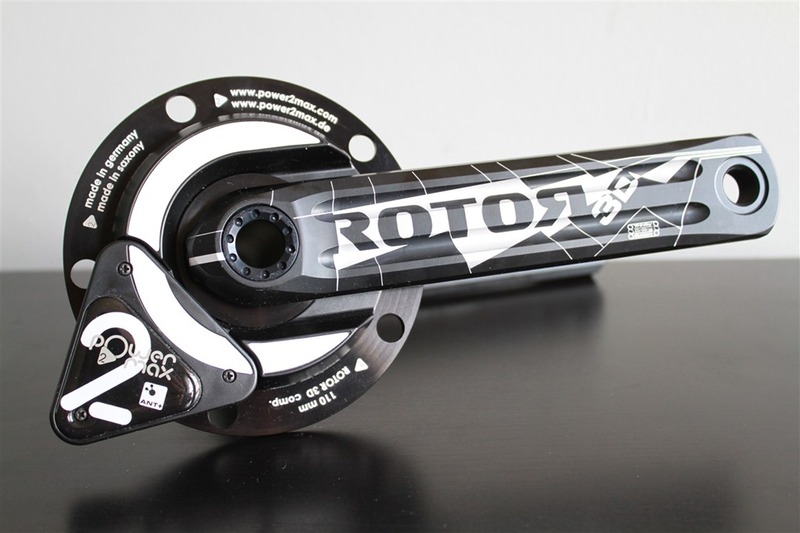 Any plans on reviewing the upcoming Rotor power cranks? As far as I know, they’ll be the first crank-based meter to offer independent left and right power. Yup, we had tentatively talked the February time frame. It’ll be after Stages. I’d guess that perhaps a Rotor unit will show up mid-late February, and then a review in March or so. …even a blind squirrel finds a nut once in a while. On left-right power, wouldn’t data showing consistently lower power from one leg suggest that the rider should do some one-leg drills or strengthening of the weaker leg? 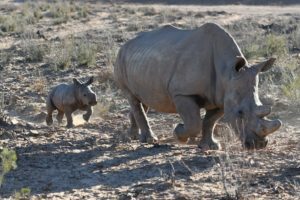 I’ve always thought that was the purpose of left-right power — to reveal a relative weakness or technique flaw that would otherwise be hidden. The challenge is that what ‘smart people’ (people that do studies for a living) are finding is that when they try and focus on improving one leg, it actually ends up lowering the overall wattage as the other leg tends to drop (without the person realizing it). In most cases, people tend to have a fairly small difference (2-4%) between legs. If you were something like 60/40, that’d be totally different – but that’s typically the sign of an injury. Ray, thanks for the comment detailing why left/right power balance provides little useful information. This has caused my to give up waiting on pedal-based power meters. I think you should share this info more widely. Indeed, I’ve been including it in all of my Left/Right related posts. The one thing that pedal-based PM’s do provide though is ability to be moved easily. Well, in theory anyway. I didn’t find the Polar’s to move easily. The Brim’s were of course simple because it’s cleat based. From what I’ve toyed with of the Vector’s, they are reasonably easy. If I have a speed/cadence sensor and a power meter that measures cadence, which one will the head unit (Edge 500 in my case) report? 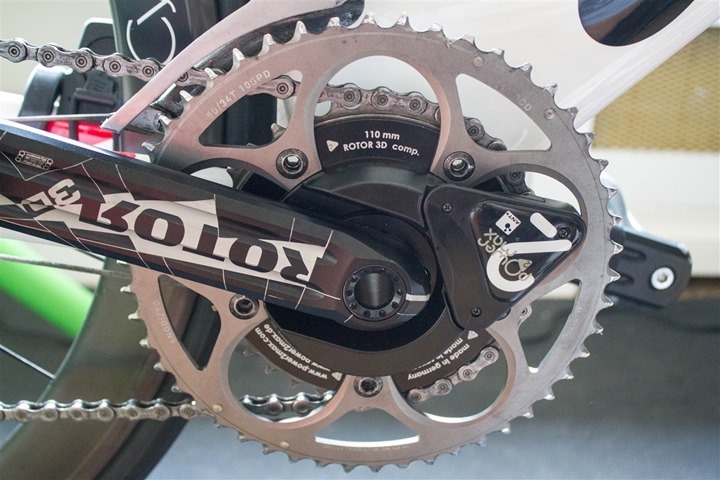 The crank-based power meter will override the GSC-10. However, a hub-based PM won’t (the GSC-10 will win). I want to know if it’s accurate/stable enough to be useful. It’s a super low price ($700) compared to other power meters so i’d like to know what the tradeoff is. Thanks for yet another in depth review Ray, they’re always a pleasure to read. Question for you, I’m looking at the upcoming Dura-Ace 9070 system (and before anyone gets cranky, I’ll only be purchasing if I hit certain performance benchmarks beforehand, I won’t ride a fast bike slow!) and am wondering if you have an opinion on a crank based meter that would be compatible with both a current 105 – 5700 set up and the new Dura-Ace (with it’s freaky four armed asymmetrical spider). I will confess to not having enough specific mechanical knowledge to figure this one out. My understanding is that Shimano is staying BB-92 is Hollow Tech II compatible, and the 105 is BB-24 Hollow Tech II, but I’m a bit vague on the rest. Sorry for the rather specific request for advice. To make it up, if you’re ever in England and need a guide for good eats, rides or such, I’ll be more than happy to help! My concern is specifically on the front chainrings, since they have stated that they would be the same width as the old 10 speed rings, but with revised chain and tooth profiles to work with the 11-speed rear cassette. I haven’t been able to find any images of the rings without the dura-ace crankarms attached, and am wondering about compatibility problems with other manufacturer (read: Rotor) chainrings working with the new chain specifications / the inability to mount a 5 arm spider on the new – DA rings. If you want to get the best out of the new 11 speed Dura Ace as well as use a PM with 10 speed 105, then best option is probably to use the respective chainrings/cranks teamed with a powertap or a pedal based PM (with the Look Keo Power the only one available now). That is not to say you couldn’t use a quarq / P2Max / SRM with a single set of chainrings that work with both 10 and 11 speed chains you just won’t get front shifting to work as well as the matching chainset / rings. Do you intend reviewing the iBike Newton any time soon? Nicolas here from power2max. First of all thanks a lot to Ray for this detailed test. We appreciate very much the time and effort you put into this. 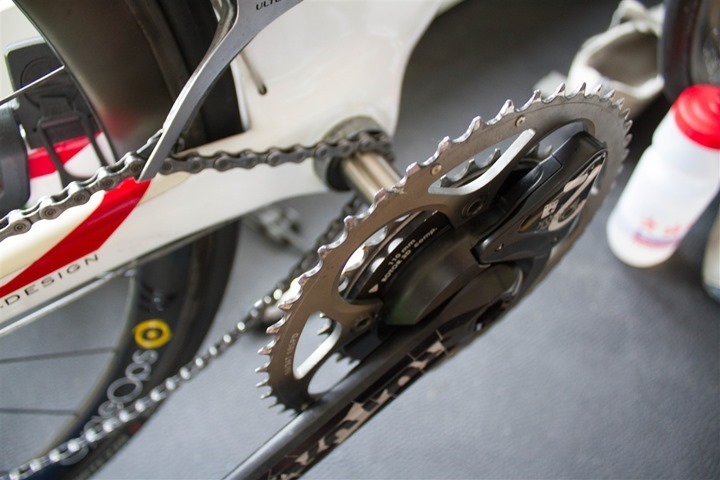 Why you can change chain rings without recalibrating: power meters are affected by chain ring changes if what they measure is affected by “where”, i.e. at which chain ring bolt, the force is applied. 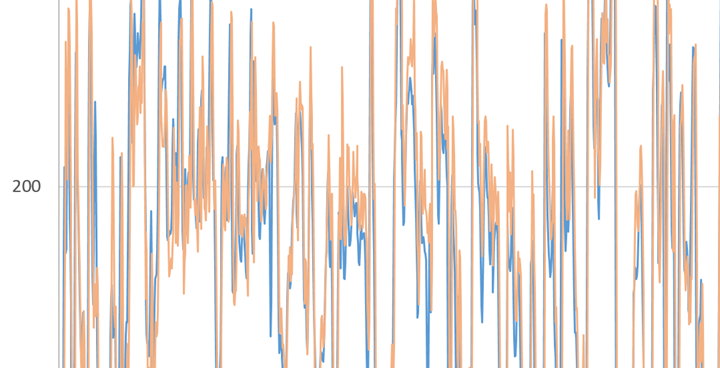 We call this “rotational variance”. If you manage to eliminate rotational variance then you eliminate the influence of differently flexing chain rings or uneven chain bolt torques. We have managed to eliminate rotational variance in our power meters. How we did it is our secret sauce. How often we sample: We use a very high sampling rate of 50Hz, i.e. 50 measurements per second. This gives us very precise measurements and allows you to use oval chain rings without problems. Regarding use with 11-speed / Dura Ace rings: you can a power2max with an 11 speed system without problems, you just need to use 11-speed rings. You can also use 11-speed rings on a 10-speed system without problems. Unfortunately you cannot use Dura Ace 9000 chain rings because of their proprietary bolt pattern. You say the P2M samples at 50Hz. But what exactly is being sampled at 50Hz? 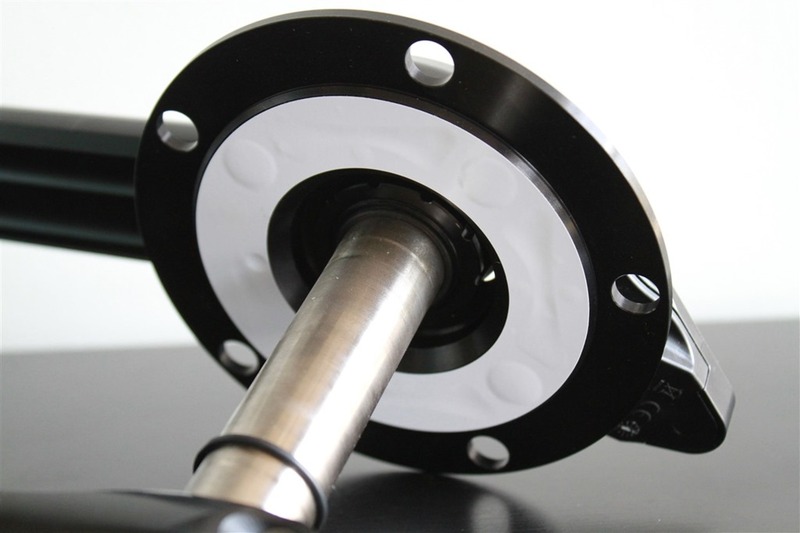 If that’s just the torque sampling rate and not the crank rotational velocity sampling rate, then the P2M will very much have its accuracy affected by the use of oval chain rings. My understanding is that rotational velocity is only sampled twice per revolution, and is based on identifying torque peaks (if it is, then there are timing error issues with that method). But I could be wrong on how P2M samples crank velocity. 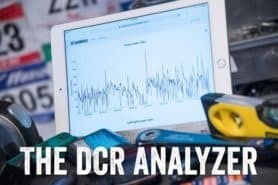 It would be very helpful to know exactly how (and how frequently) P2M is calculating the rotational velocity of the cranks and what data it actually uses to calculates power (as this affects not only overall power meter accuracy, but also and under what conditions accuracy is affected). apologies for the late reply – didn’t check here for a while. Cadence and power are updated at the same rate (50hz). Thanks for the review. What’s the weight of this Power2Max meter? I’ve added all the weights into the comparison table above. Enjoy! Ray, thanks for an absolutely amazing website. 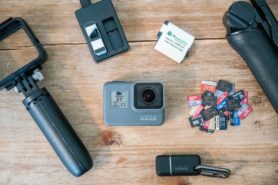 It is very helpful for me to have some 3rd party insight into what gear and which gadgets are worth spending money on. To the power2max device; I have recently purchased one with the Rotor crank 3D+ option (for BB30), apparently quite similar to the version you have (in this review). Judging from the fotos in your review you got yours with the crank and the spider still not assembled. Later these two parts appear (magically) assembled without much detail on how this was performed other than the foto with the vice. Did you assemble the crank and the spider yourself? If so how did you manage to apply the proper torque? First I don’t have a torque wrench for this job – mine is a “normal” 1/2 inch socket type and that won’t do. Second the torque for this part of the assembly was not found in any of the accompanying documentations from power2max nor from Rotor. I asked power2max and they said 40-50 Nm. 3. Did you apply any retaining compound or threadlocker (loctite) during the assembly? Funny, you noticed quite well in the installation photos. I actually had two different Power2Max units. The first was the pre-Sept 2012 unit, which came as pictured with the crank arms on it (but not chainrings). And then the second unit was one of the new units, which was just the Power2Max spider itself. So, for the first one, I just had to add the chainrings and install. But the second one required me to remove not only the chainrings (easy), but the darn crank itself. That was PITA! And, the resultant being the vice. My vice was too wimpy to do the trick (I literally pulled it off the counter). So I had to go to a local bike shop and have them assist. Once it was off, I was good. Then, applying torque I used a torque wrench, which allowed me to apply it based on the parameters specified on the sheet you see pictured early on. It’s on the ‘proof’ sheet, that single page with your serial number/etc, very bottom of that page. I did not apply any thread locker. It’s unclear to me if they (or their distributor) did, but it was as noted a nightmare to get off when changing from first unit to second. rest assured, your readings will not be affected. You don’t have to go as hard as you can, 40NM is “pretty tight” but not “popping veins in your forehead” tight ;-). One thing i’ve been thinking a lot about lately is durability when you compare crank based power meters to pedal based meters. My pedals are always scuffed and get fair bit more abuse than my cranks (kerbs are to blame in many cases). Are the pedal systems (keo power/upcoming vector) known to withstand this kind of abuse without any issues? It depends. Most pedal based power meters are modular. Check out my Keo review, or the post for vector titled “Everything you ever wanted to know about Garmin Vector”, where I show all the components taken apart. For both of those systems, it’s actually not the pedal you worry about, but rather the small transmitter pods attached to the sides. Long term we’ll have to see how they stand up. But in general, short of a failure of an unrelated part (as was my case), it’s actually harder than you think angle wise to hit the pods. Thank you very much for the review, I’ve been looking forward to this one for a long time. I’m too about to make the decision whether or not to buy a PM. However, one aspect that I’m unable to find any information on is the expected lifetime of various PM units. For example, if a P2M unit can be expected to last 3 years, and a Quarq 6 years before it gets cheaper to buy a new one than to repair… the P2M unit might not be the best deal after all. I realize that many of the units on the market today might not have the track record to prove their reliability, but these things can be quite easily tested/simulated in laboratories. I’m certain that these companies have put their units through some serious tests; I just wish that their results would be made public. After all, if I pay $1000+ for a PM, I would like to know how long it will last. Yeah, I don’t think we have that type of data at this point for P2M. They do have a solid warranty program that I talked about in my Eurobike Power2Max post (including crash replacement), linked up above early on. I should probably make note of it here as well. I’ve had my Quarq for I think almost 5 years now. Trying to remember exactly when I got it, 2008 I think, 2009 at latest. Is there any issue with using the P2M (or any other PM for that matter) with Q-rings? Per their comment above, they support that. I have given up on Vector. Unsure whether to buy the power2max or the recently announced, yet to be released Quarq Riken (February 22). Yeah, I don’t expect Vector before summer at earliest. I think either of those two PM’s (P2M or new Quarq) is solid. They’re both very similar from a spec standpoint. Support-wise Quarq is probably a touch-bit easier to deal with if you’re US based, but it’s also a touch bit more expensive. Absolutely. I’ve seen some posts by folks with 1st generation Power2Max units showing upwards of 40w of drift (on 200w). I haven’t seen any reports of drift with 2nd generation units. I have a P2M power meter and Garmin Edge. Should I remove the GSC10 an pedal magnet or is there no conflict there? No conflict, I run them both. Just out of pure curiosity, I heard P2M would misread (with lower numbers) the max power; noticed anything about that? Great and interesting review as always! 1. On the small compact chainring it is not clear to me which side of the chainring should be facing the frame (against the bike). The chainring has dots on both sides, and one of the sides has a number combination as well. 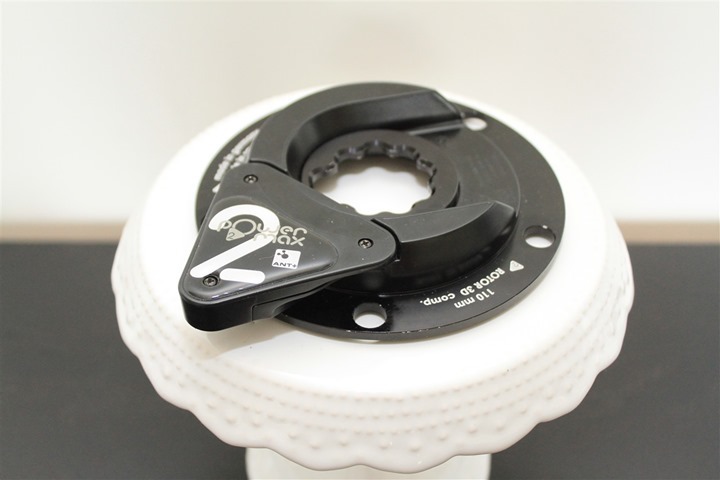 From the manual: The orientation of the oval is positioned differently for the inner and the outer ring because each ring serves a different purpose: inner for climbing and outer for time trialing or sprinting. We changed the orientation for the inner as your geometry, body position and pedaling changes when you are climbing (front wheel is up). 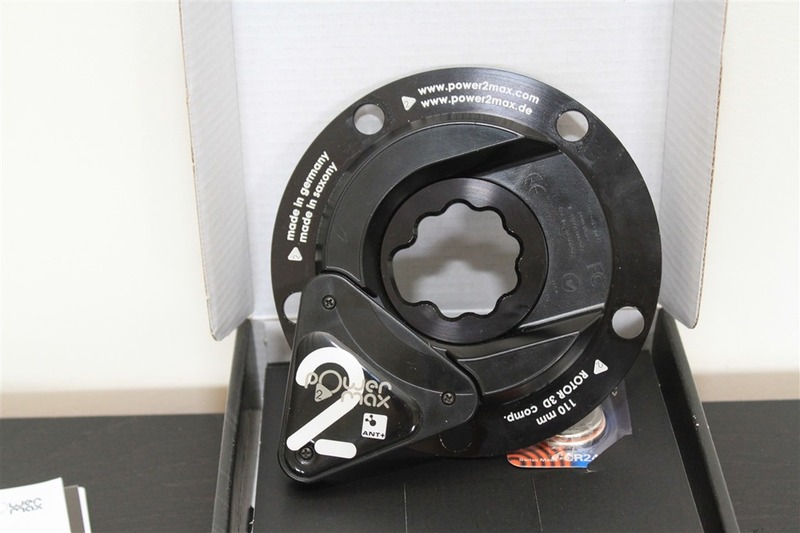 Pyry: I think your question is specific to Rotor Q-rings and not the Power2Max power meter. Q-rings are pretty difficult to setup properly and require a lot of trial and error in choosing the offset position that works best for you. I suggest you search posts on one of the bike discussion forums on how to go about doing this. Ray didn’t use the Q-rings, so this probably isn’t the best place to get a good answer. I considered Q-rings as I think they may offer some efficiency advantage, but decided I didn’t want to deal with setup complexities and slightly diminished shift quality. Thx Cariton, you are perfectly right, my apologies. My problem is that the guys in Germany who sold me both the P2M and the Q-rings do not have an answer to these questions. I have the P2M with Aero Qrings (130 BCD with 53/39). On each Qring you will find small marks on the holes, look for the one with 3 small drilled holes. This is supposed to line up with the spider bolt FURTHEST from the pedal (ie directly opposite the crank arm). This is true for both inner and outer rings. This is the default position and there are 5 other positions you can use should you wish to tune your pedal stroke. Rotor recommend you start at 3 and run that for a while. This was my hypothesis. It is however extremely interesting as this means that the ellipses of the chainrings are not parallel to each other. 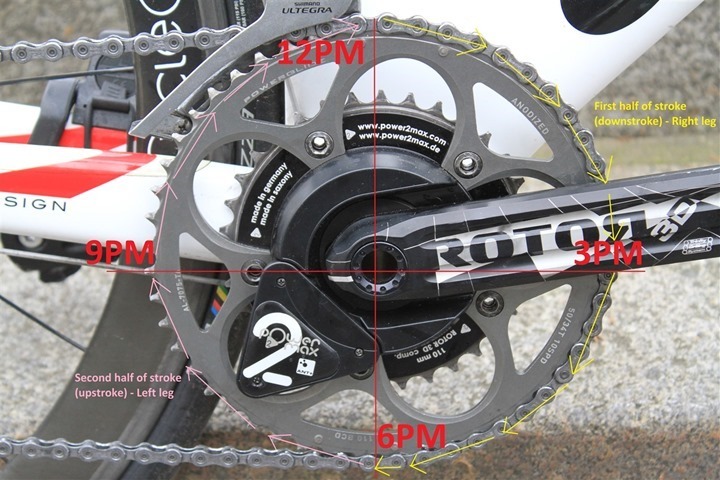 If you had x-ray eyes you could se that when the outer chainring at its “fattest” (9 o’clock and 3 o’clock) is horizontal to the surface , then the smaller chainring is at approximately 10 or 11 o’clock and 4 or 5 o’clock. Is this your take as well? Nicolas here from power2max. Sorry to hear that the communication didn’t work out well. I use my Rotor 3D+ power2max with Q Rings, both on Position “3”. The ellipses of the Q rings are parallel if you make sure that the inner ring has the dots facing inwards (towards the frame) and the outer ring has the dots facing outwards (away from the frame). Rotor’s manual (see here: link to rotorbike.com) has a good picture for the inner ring. It actually happened to me that I mounted the inner ring the wrong way round on my first ride – definitely not fun having to climb this way! Hope this helps and have fun with your power meter! 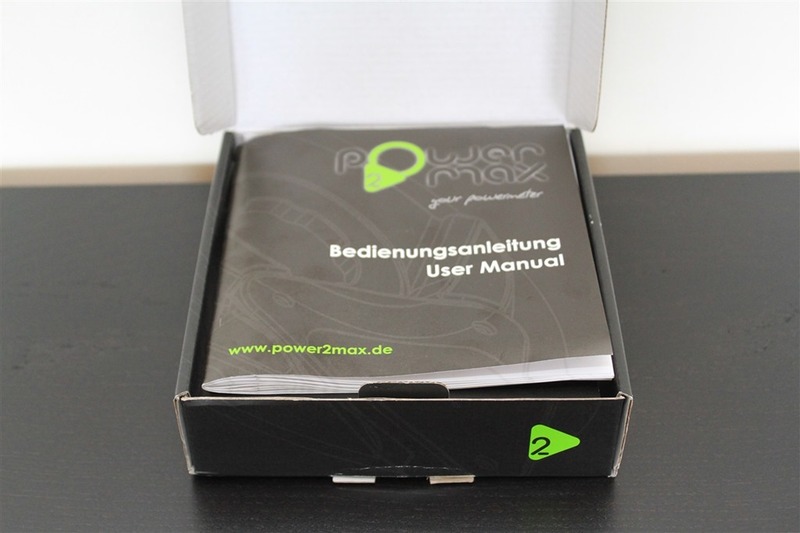 I actually mailed a detailed .pdf, six pages with pictures to “support@power2max.de”. (at 11.23 Helsinki time feb. 5) Would you have a chance to take a look at it? As I do not have your mail address I cannot mail it directly to you. Hi, Thanks for the great review! I am new to the power meter search and am hoping you might be able to suggest the best option given I have a Cervelo P5 Six on order. Every bike store I visit gives me a different option and insists it’s the best. Thanks! KW: I think Ray’s disclaimer makes it clear that there are a lot of good options and no definitive perfect solution. Having said that, it appears that price isn’t the primary factor given the bike selected. An SRM power meter seems appropriate as it is highly regarded and priced accordingly. But I think your bigger concern should be compatibility with the BBright bottom bracket the P5 uses. Ideally, you would want to avoid using an adapter (to another bottom bracket standard) if possible. I think Carlton kinda nailed it. Every bike store will give different opinions based either on product experience or product kickbacks from their distributor. I think it really comes down to your use case, and how much you want to spend. I don’t subscribe to the theory that you HAVE to get an SRM to get valid power data. The vast majority of folks out there do just fine without SRM’s and with other companies. If you aren’t switching wheels out, then the PowerTap is a great and well proven option. If you swap wheels out, then look at the Power2Max and Quarq. Power2Max with the model noted above, and Quarq with the new models they just announced last week. Between those two units, there are realistically few differences beyond crank and BB compatibility. I see those as the three to focus on. You won’t go wrong with any of them. Do you stil have the files for where you did the comparisons of the power2max against the quarq and powertap? Just wondering if Messers Chung and Anhalt could be persuaded to run a similar set of comparisons between the power2max and these as they did with the stages power meter (or does this take enormous amounts of time – I’m kind of assuming they can almost take the relevant files and push a button to get the required comparisons now that they’ve had to set up a utility/programme to do it for the stages review?). 1) Would be a nice to have in terms of the recommendation that the power2max is solid and comparable to these two better known options – especially as the stage power meter “looked” fine on a lot of the averages etc (it demoed well you said) but only once you dug deeper could you really see where there were issues. 2) It might mean that some of those who aren’t willing to accept or are making excuses for the stages have less of an excuse for it if there can be shown that on the testing protocol you use now 3 other powermeters all showing fairly constant differences whereas the stages is a bit all over the place (assuming that the power2max performs similarly to what you would expect – ie the same as the quarq v powertap test you’ve now put up in the stages review). Yup, it’s something I’m looking at. Thomas actually did do some quick analysis in the same vein of it that we didn’t quite end up making look pretty yet. He said they looked “really good” (in reference to the differences). I can’t do both the Cinqo and the Power2Max at the same time, due to the fact that they are both crank-based PM’s. So instead we did P2M/PT at the same time, plus tons of trainer data. Tons. Additionally, some of the ‘standardizing’ of the tests (such as power/cadence sweeps) didn’t really happen until now. It’s an area that we’re working on to truly nail a standard for all the PM’s, as well as the PM head units. Another Great Review Ray! I just purchased the SRAM RED 2012 groupset. I really wanted the crankset with the quarq power meter, but I couldn’t justify the additional $1600+. So I was very excited to read this review of P2M. So today I visited the P2M website to look into the availability of the power meter for my SRAM Red cranks but I didn’t see one. So I contacted P2M and really received a quick response….not the response I wanted, but a quick response nonetheless. Kudos to P2M for your quick response to customer questions/concerns. Here is the response that I received. When I asked for clarification, I received the following response. So…maybe P2M will reconsider and build a power meter for the SRAM RED crank soon. Please? Pretty please? I have a Rotor 3D+ and can’t get the crank-arm to loosen so I can install the P2M. Do you have any tricks for this? Yeah, it’s a bit tough sometimes. I went to a local bike shop, and they had a bigger vise fully bolted to the table, and that did the trick. as you can see from your Sram Red crank it has a carbon fiber integrated crank, ie. it can’t be removed and replaced with a Power2max powermeter spider. So there will never be a Sram Red powermeter, there could be a Sram based powermeter, but it won’t be a Red. Myself I have old Sram Red setup with Rotor 3D+ power2max cranks. You could use any of the power2max compatible cranks with the new Red groupset. For my clarification, will the pedal based power meters show 0% on the upstroke (assuming a 1-legged drill), even if you are ‘pulling up’ on the upstroke? I see the 80-90% as a good thing – knowing that 10-20% is coming from the other leg. If you do one legged drills with your right leg, all of the power produced is coming from your right leg and none from your left leg. With a pedal power meter, the fact that the strain gauges are in the pedals means they independent of eachother. The right one will only measure right leg power and the left will only measure left leg power. Whether you are pulling up on the upstroke or not, it makes no difference. The display will show 100% right leg and 0% left leg, as DCRainmaker said. Assuming that you’re talking about the Power2max in this statement – that’s not how it works.. the 10-20% is from the upstroke on your one-legged drill – it just thinks that it’s the downstroke from the other leg. Ray, if you were in the market for a BB30 power meter right now, which one would you choose between the Power2Max, Quarq s975 on sale (bringing price down closer to $1300), or the newer Quarq Riken, which would you choose? It honestly just comes down to support and servicing. So I’d look at that aspect of things (where you live, where you can return it to). Accuracy wise, they seem pretty good either way. And both have pretty much the same specs. And please excuse the grammatical failure in the prior post. I live in the US and ordered my Power2Max from the North America distributor, which is located in Canada. 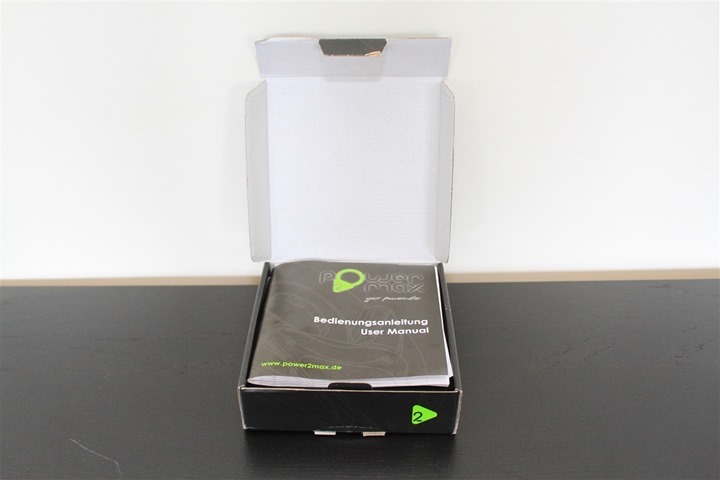 They were extremely responsive to my questions – we exchanged about 10 e-mails – and I was very satisfied with the price I paid, the delivery, and the product. I’ve read of others having similar positive experiences. If you live in the US and are wondering about the support level, my opinion is that you don’t have anything to worry about when it come to ordering or service/upgrades. I was originally going to wait for the cheaper FSA cranks to be available, but decided I didn’t want to wait any longer, went with the Rotor cranks, and have no regrets. Installation took about 30 minutes including upgrading the Bottom Bracket bearings. For anyone in the US wanting the FSA cranks instead, I was told they would be available in March. Thanks for this helpful information. 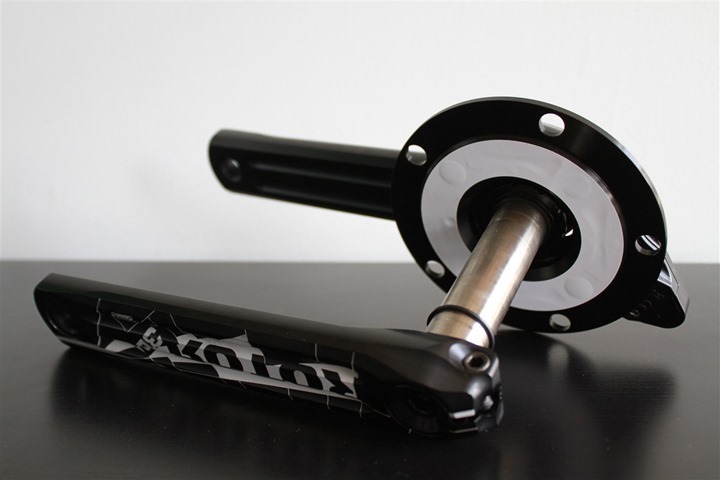 I have a BB30 bottom bracket, so it looks like the only thing available from the distributor is the Rotor 3D+, which is more expensive and I’m honestly not crazy about the graphics. Their EU site has a couple of other lower-priced BB30 options, but I don’t see them anywhere on their North America distributor’s site. John, you should use the contact form on the power2max.ca website to ask them about crank availability and pricing. I exchanged e-mails with Michael, and as of January 24th, he gave me an ETA was 4-6 weeks for the FSA cranks. I didn’t ask specifically about BB30. I agree with you on the Rotor graphics. I can understand putting their company name on the cranks, but that fractured spider web graphic is too much. Having said that, they look better on my bike than I thought they would and seem to be pretty well reviewed. The cranks are anodized black and then the graphic is laser-etched into the aluminum (removing the black anodized layer.) I decided if I grew tired of the appearance, I could look into re-anodized them all black, but am now thinking I probably won’t do so. Thanks, I filled out their contact form. I’ll post the response in this thread for the edification of others. Just heard back from Michael at Power2Max. Looks like there will be four different options for BB30. They currently have the Rotor 3D+ and Lightning carbon cranks, and will soon have the Rotor 3DF and B.O.R. cranks available (he said within 2 weeks or so on those). I think the B.O.R. 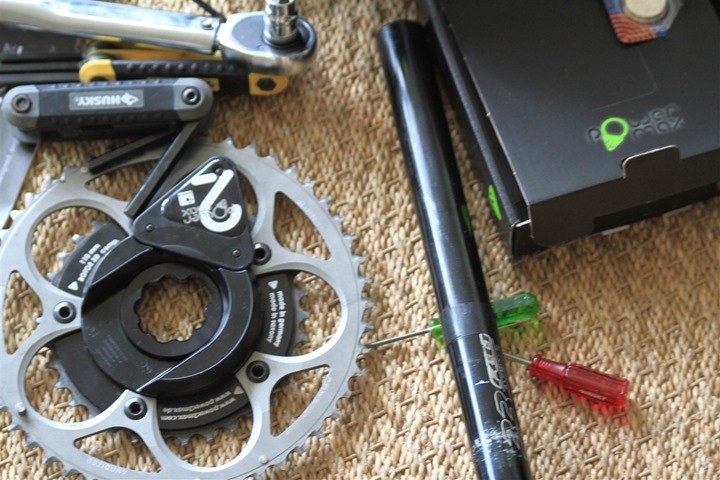 cranks are compatible with several different BB standards. Ray great review! Any ideas on where I can buy this from the UK? You will have to order it from Germany, they have no direct resellar in the UK. In reply to Rob, I purchased the P2M Rotor 3D from UK. Really simple, placed the order, recieved a reply from P2M with money transfer details and which calendar week it would arrive. P2M sent an update e-mail when it was dispatched and it arrived 2 days later. It took me about 3 weeks from order to arrival, however I did order over the new year so i think it should be quicker now. I think I’ll go for Power2Max even if the easiness to change Pedal-based PM’s seem very cool…. 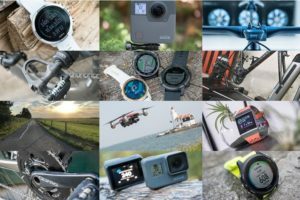 Still no news from Garmin ? Ray I admire your Tekiness! I am new to the PM Market, and it appears from your charts that the P2M reaction times about the same as the Power Tap. I have just installed the P2M and noticed that if I accelerate hard, My Garmin Head unit takes a few seconds to respond to the power change. Having used this and others yourself, Is this slow response the same with other ANT+ PM’s? 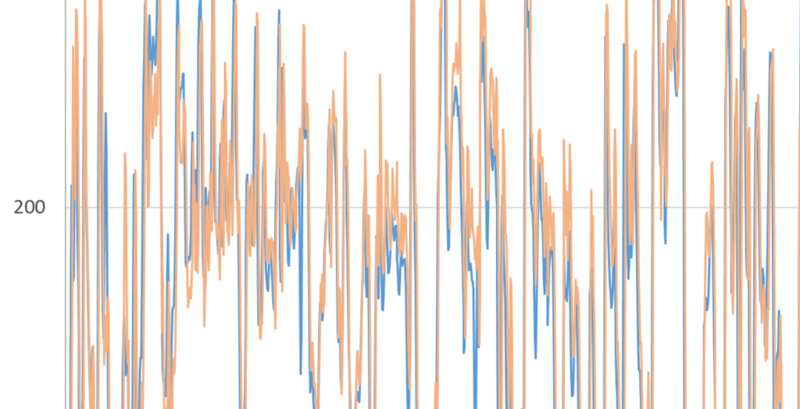 I am also wondering if this is why you showed less power average on your first 15m chunk, based on starts and stops not reacting quickly to accel power? A second or two is normal, and to a certain degree a few seconds is normal. Just to clarify, do you have 3s/30s power as your metric, or instant power? I actually had it on instant and this is where i noted the delay during short intervals. I have since added the 30 s delay for consistency. This delay is also seen with the cadence reading. 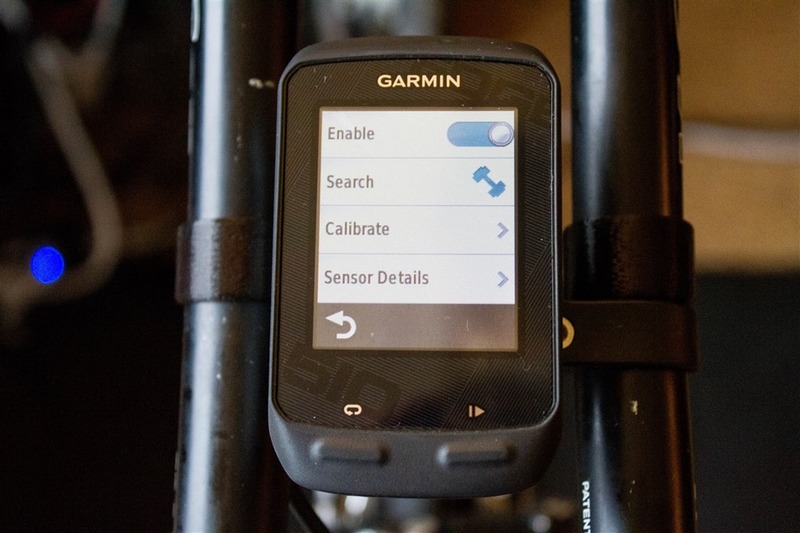 What mount are you using for the Garmin 510 unit on your extensions? Have loved your reviews for years and referred many friends to them. Shopping for a power meter, and was going to get the Power2Max but then noticed on their site that it doesn’t support my Specialized SWorks Fact Carbon Crank. Other than replacing the entire crank (via Power2Max or Quarq), what would be my best power meter options? I had a Power Tap but sold it because I didn’t like the wheel it was on (and would now prefer crank or pedal/cleat based flexibility). Have been waiting for Garmin Vector but the Cubs may win the World Series before it comes out. Brim Brothers looks like a good option – hopefully out soon? I use a Garmin 910XT as my head. Yeah, it really comes down to swapping out the crank, or waiting for something else. I’d suspect you won’t see Brim Brothers any earlier than fall (again – absolute earliest, but it could be next year). And Vector – who knows. They said on conf call ‘this summer’, but we’ll see. As Ray has said before, if you’re looking for a power meter, look at what’s currently available and make your decision based on that. Don’t keep delaying for unreleased and unproven products (unless you don’t really need a power meter in the first place.) In my opinion, Garmin and the other companies pre-announce their products to cause paralysis in the market so people don’t order competitive products. I missed having a power meter the entire 2012 season because I was waiting for Vector, but I finally decided I couldn’t wait any longer, and ordered the Power2Max. I’m so glad I did; it’s made a huge difference in both my training and my races. And it’s completely erased the need I thought I’d have for any of the advantages Vector might have, especially given that Vector is likely to be much more expensive. Look at your budget, look at the reliable products that are currently available, and make your decision based on that. I think Power2Max, Quarq, and PowerTap are the best bang-for-the buck. I purchased the Power2Max with the Rotor cranks and I’m extremely pleased. I have absolutely no intention of swapping out for Garmin Vector if/when it is ever released. You wouldn’t be able to use your existing crank arms in this setup, but I don’t think you’ll have any complaints with the Rotor cranks for the cost. I found the North America Power2Max to be very competitive on pricing, so you should at least send them and e-mail and explain your situation. Good luck choosing a power meter! Hi Ray, Before adding the P2M power meter, I have been spoiled with the flawless shifting of my shimano 6700 cranks.. I am now in no-mans land of chainrings. I have tried the stronglight compact chainrings and found that they do not shift as nicely. From your articles and various cranks, I am sure that you have been through this as well. 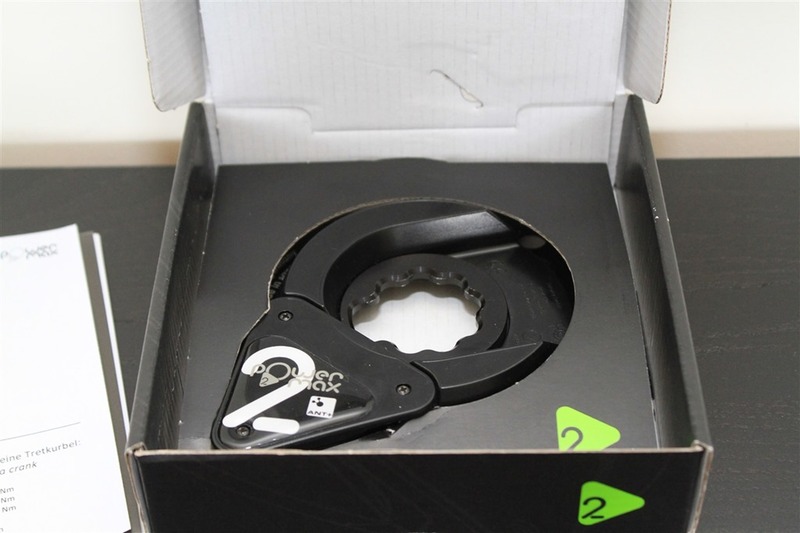 Have you found a set of chainrings that shift nicely for use with the P2M Power meter? I’m using Praxis Works chain rings and they shift flawlessly. They are forged just like Shimano (as opposed to being cast like most other rings), making them very rigid. I have Shimano Di2 electronic shifting, which puts significantly more stress on the larger front ring vs. mechanical shifting, and the Praxis Works rings handle it fine with no flex or hesitation. I think they are the best option for anyone not using a Shimano crank. Do you know if P2M is able to use with O’symetric rings 50×38 BCD110 ??? Yes, O’symmetrics will fit on 110 and 130 P2M. Also, given the way that the P2M uses accelerometers to measure cadence, they should also be more accurate with elliptical rings than PMs that use cadence magnets and assume constant angular velocity. Are you still happy with your P2M? Within the review I noted that I changed units mid-way through. The first unit was the first generation P2M without the L/R and temp compensation. The second was the 2nd generation (post-September 2012) with the temp compensation and estimated L/R information. All data from the review is done on the 2nd generation unit. The only thing noted on the first generation unit is some of the photos. Once the review was over (it lasted about 6-7 months all-in), I sent it back to them. I’m now onto other PM’s for test (currently a Quarq Riken). The white arc is an adhesive plastic strip and is available in several different colors. It’s easily removed. Thanks, Carlton. I’ve been umming and ahhing about having one with the white strip or ordering without. Sounds like I should just go for the white, and remove it if I don’t like it. I have read the whole post above and the comments but I can’t seem to find the exact answer to my query. I have bought a power2max and had it installed by a bike mechanic. I am happy with it except that i (and my coach) think it’s showing slightly lower watts than expected. Can you please confirm the exact calibration process i should be doing before and during my ride. Also, is there anything that the mechanic could do wrong when fitting it that would affect it? The only thing I can think of would be not tightening the bolts to the correct spec, and then post-that, not doing a few short sprints. You’ll want to do a handful (2-4) short and really hard sprints to “set” everything. Then do a manual calibration with no weight on the pedals (unclip, put crank arm at 12PM/6PM), then manual calibration on head unit. Can your coach (or one of their other athletes) lend you a powertap wheel (+ second head unit) to compare against for an hour? I am actually going to do a test on my coaches computrainer in the next few weeks to do an accuracy test, which will tell me one way or the other. A) My user error – not doing calibrating it properly (very possible because I wasn’t aware that I should have done the sprints or the manual calibrations). B) An installation error, very possible as i didn’t watch them do it. C) Faulty unit – from what I read pretty unlikely. Just to close this topic down. I did my monthly test on my coach’s Computrainer and the Power2Max was within 1-2% of the power numbers shown on the Computrainer. My coach believes it’s much more accurate than his Quark. Turns out i am not the cyclist we thought!! First thanks for your amazing blog, very useful for me since i have started triathlon 2 years ago. I am looking for a power meter and i remember your article about the Power2max. So i tried to contact their website to be sure that my frame is compatible with their model. Unluckyly no answer. i ride a Ceepo Venom and i would like to be sure that what i will order will be suitable. If you have any contact details to join them i will be grateful. I know the Power2Max folks are monitoring that thread via alerts and have been responding like crazy to folks. where are these available to purchase? cant find on the internet? You purchase directly from Power2Max (http://www.power2max.de). Just got one of these and set it up last night. Using it with an Edge 705 and was surprised to see that the Cadence was showing as zero even though power was showing correctly. Can anybody verify if I am missing something or if the 705 can in fact only use cadence from a cadence sensor and ignores the cadence value transmitted over Ant+ by the power2max ? The 705 will definitely pull cadence from the P2M, so that’s very odd. Any chance pressing start changes things? No change pressing start button. Bought the 705 Nov 2009 and never applied any firmware updates. Have borrowed an Edge 500 and will see if it picks up cadence from it this evening. However I did not pause during any of the laps, cadence was quite high so if connect does think there is zero-data power not sure why. Thanks, firmware update sorted all problems and provided a lot of extra power data fields. do you know a single point difference in offset value, how many watts at 90rpm is? I’ve picked some info on web and it seems 1,5w per point at 90rpm. I know Quarq is 1w on 3 point difference at 90rpm but i don’t know the power2max relationship…. Thank you Nicolas, this is exactly the answer I was looking for! Dear Nicolas, as you’re so kind I ask you a more precise information. Today I did a test hill of 30 minutes. At the start of the climb the offset value was -1010 (negative), at the end it was -1015 (negative). The 5 shift point at 75-80 rpm could be 5watts right? So what does it really means? If at the start of the hill I was pushing 250watts and at the end the same power 250w, the real power pushed at the end would be of 245watts? Given this, have you now had a chance to confirm this brand name is needed or why they went with this one compared to the 2032? I have no idea why other 2450s wouldn’t be compatible, but they probably go with that over a 2032 as they have nearly double the capacity. @Simon: you can safely forget about the zero offset number. When you are pedaling and the zero offset changes because of temperature changes, the power2max automatically stays precise through the temperature compensation mechanism. It adjusts the zero offset continuously whilst you pedal. @Scott: please only use a Renata battery. The batteries from other manufacturers tend to be a bit thicker and don’t fit well in the battery holder. This can lead to poor contacts or even damage the holder in a worst case. The batteries are very cheap at amazon, we also have them in stock of course. Matt is right: we use the higher capacity 2450N because we do more stuff in our power meter :). Thanks for the response Nicolas…. will this same requirement be on the new series you are getting ready to come out with? we continue to use the same battery format, but have tested other battery makers, too, and others work, too with the new Type S.
@Nicolas, thank you very much for the reply! P2m is a great product and I really love it but mine is a tecnical question. I know about the temperature compensation but a drift in offset value means however a drift in a bit of watts right? So i would only know how this small drift how can be precisely calculated. your calculation would be right if there was no temperature compensation and the power2max had no opportunity to auto zero (continuous pedaling). However, since the power2max adjusts the offset continuously through the compensation mechanism whilst you pedal 250w remains 250w. That’s why I said you can forget about the number you see :-). @Nicolas: great reply! thank you! The last question. You say that the temperature compensation mechanism adjust the offset but If I read for example -1020 and after 20 minutes I check and the value (on my garmin)and it’s -1015, is there a difference in watts or not? but in my idea the offset i read after calibration on my garmin should be the real reference. Am i wrong? If the mechanism could work in perfection (i know it’s impossibile) it should always show -1020 from start to end. I think the misunderstanding is in how the temp compensation works: it doesn’t keep the offset number constant, but up to date at all times. So in your case the compensation mechanism changes the offset number gradually in line with the individual characteristics of your power meter as you pedal from -1010 to -1015. This is why every power meter goes into a climate chamber during production and the temperature characteristics are programmed into the power meter. Hence there is no difference in the power reading during your hill intervals – your power2max always uses the appropriate zero offset for the temperature it is operating in. When you use the “calibrate” function on your Garmin it only asks the power meter to report back the zero offset number. 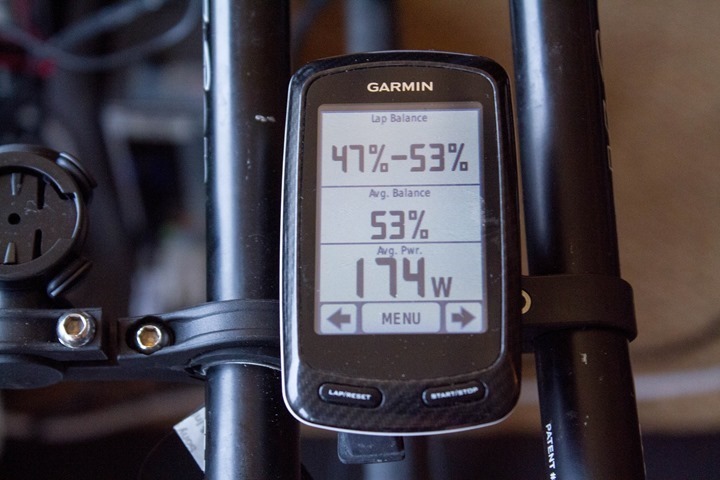 It does nothing else than the power meter does by itself when you stop pedaling and it zeroes by itself – except that it displays the number on the screen. 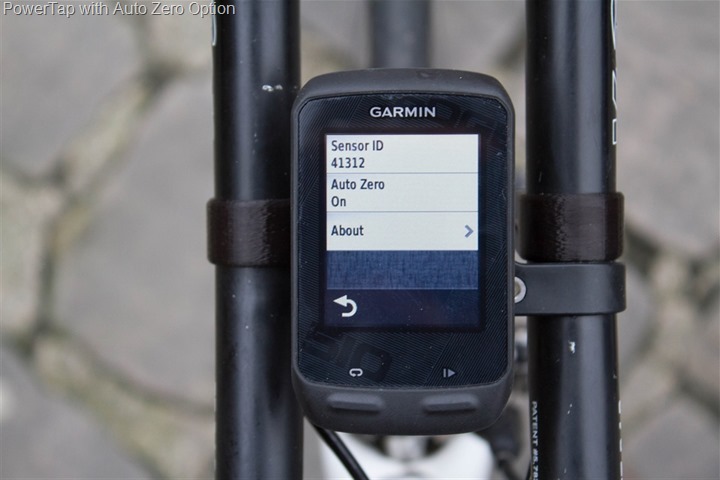 So the auto zero and temperature compensation work in tandem and are a “belt and suspenders” approach to keeping data correct: auto zero every time you stop pedaling or manual zero when you push the button, plus temperature compensation between auto or manual zeros. Now that’s all clear! thank you very much and I hope to hear about Type-S release date as soon as possible! bye! hello i have a ultegra cranks and i am about to purchase the fsa gossmar P2M would it be wiser to purchase the rotor 3d instead are the fsa cranks are they really that bad? Harry, I agree with Nicolas that there is virtually no performance difference between the FSA Gossamer and Rotor cranks. It’s really just a matter of how much 100 grams of weight reduction is worth to you, and which one you think looks the best. When I ordered mine a year ago, the Rotor version was the only one in stock. I wanted the FSA Gossamer version because of the lower cost, and I also liked the appearance better. Having said that, after installing the Rotor version, the graphics weren’t nearly as “over the top” as they appeared in photos and I quickly grew to like the appearance. I have no complaints about the performance either. 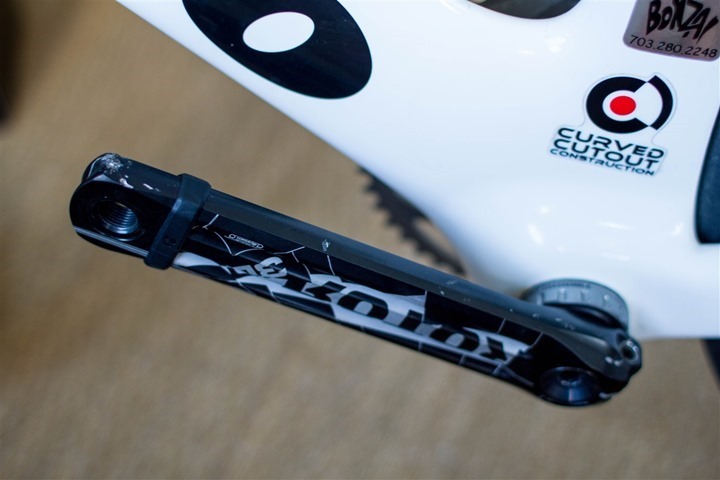 the FSA Gossamer is heavier (about 100 grams) than the Rotor 3D, but both are very reliable cranks. The FSA Gossamer is forged, the Rotor 3D CNC machined. the rotor 3d plus is 30mm spindle and will not fit ultegra 24mm BB… you need the rotor 3d crank which will drop right in as it is a 24mm spindle. Will – Matt is absolutely right. Matt, thanks for giving support, we appreciate it! Can anyone comment on how important it is to attach the crank to the P2M according to the manufacturer recommended torque? Will it affect the accuracy of the powermeter if it is too tight / loose? I installed my P2M to a Rotor 3D last night but couldn’t figure out how to use a torque wrench to tighten the lockring to the recommended 40 – 50nm. I used a wrench and did it as tight as I could with some loctite so am confident it won’t come loose. Just more concerned it’s affecting the power readings from the P2M. 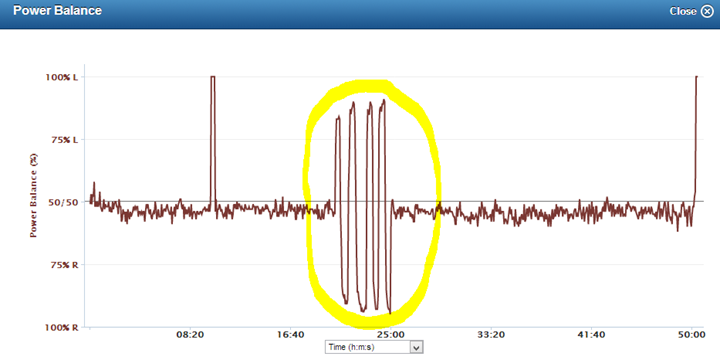 I had a little discovery using the Power2Max on the trainer last night. I was doing high RPM spin intervals. It appears that once you get above ~158 RPM (I know it’s not something you’d do on the road) the P2M loses it’s ability to record cadence accurately. In fact, the only high cadence values it appears capable of are 166, 187, and 214 and nothing in between. Sorry I can’t test any higher than that 🙂 Ray, I noticed a 166 max cadence in one of your screenshots… not a coincidence I’m sure. I’m going to put my cadence magnet back on to override the P2M when I do those intervals again. For real world RPMs though, the cadence readings seem fine, though slightly delayed. well spotted – this was noticed a little while back and we updated the firmware to allow up to 200RPM now. Nicolas, I have the newest version (non S-type) and was able to record above 200 rpm. It’s the lack of granularity in the readings that I’m referring to. It appears the only readings above ~158 are 166, 187, and 214. Nothing in between. Once again, not a deal breaker for me as this is an indoor only drill and it’s easy to slap on my old cadence magnet and have my speed/cadence sensor handle this function for these kind of intervals. Nicolas, I purchased my P2M in early November 2013 (North America). Wouldn’t that have the latest firmware? we made that change around that time. Nicolas, Is there a publicly available list of firmware version release notes? I know an end user cannot update the firmware but It would be great to see what has been changed. Also, is there a way to know which firmware version I have installed? sorry for the late reply. Nope, sorry, there is no such list. I think some head units show the FW version. My wife has been riding her Power2Max on the trainer for a few weeks now. On a few occasions after calibrating she has had to recalibrate after 15 min or so because power #’s were low and then it was fine. She rides on a trainer that has a lever to increase/decrease resistance in the fluid unit so she basically never shifts. Today recalibrating didn’t seem to work after several tries (watts about 15-20 low) so I had her shift to the big ring up front and also shift in the rear and that seemed to work. Seems strange that shifting would matter but wondered if anyone has any thoughts? Thanks!! to help me answer your question – how did you get the impression that watts were low? Ie what what the point of reference? I’m asking because fluid trainers can vary in resistance, depending on the level, temperature, pressure of the tire, etc. For example my Elite Fluid would take about half an hour to “settle”, during which resistance slowly increased. In all likelihood it was an interplay of a number of these factors. The only power meter related reason could have been that it had a “wrong” zero, but if you do an auto zero or manual zero that can be excluded. I am always very cautious in using non calibrated home trainers as points of reference – they are resistance units and not built to the same precision as a power meter as they don’t need to be. Nicolas,Thank you for the prompt response! 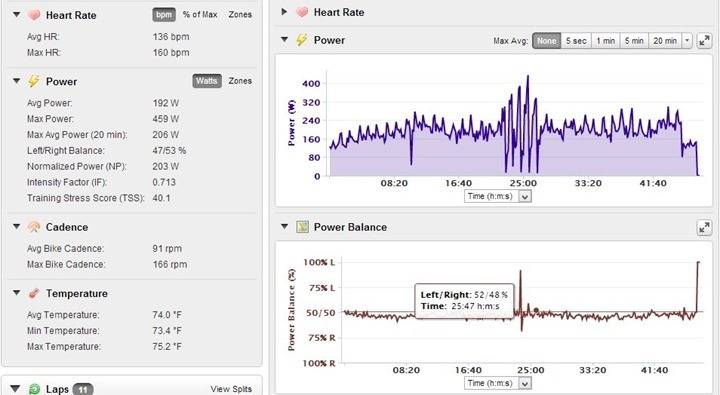 We compared her heart rate and cadence to 5 or 6 previous workouts and the heart rate at the same cadence was up 12-14 beats higher at about 12-15 watts lower. Then when I had her shift gears on the bike (about 40 min into the ride) and not use the resistance lever on the trainer it was fine. Makes me think it could be related to the fluid unit on the trainer? I also have been having her stop and backpedal occasionally to auto zero. Would that take care of zeroing issues? 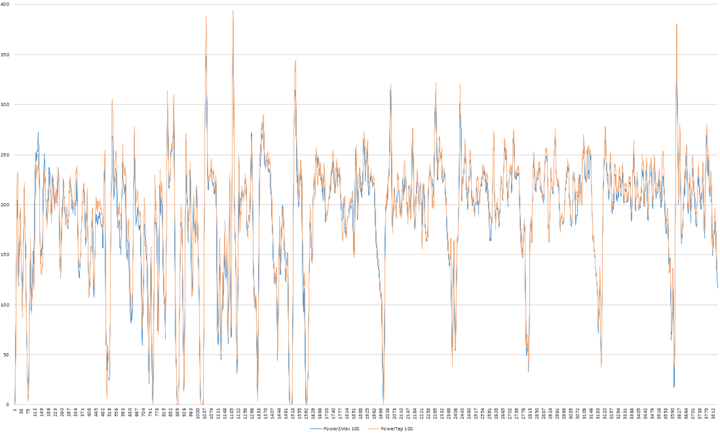 HR to watts can vary for me personally a lot – based on cadence, temperature, fatigue, etc. So again I would take these things with a grain of salt. 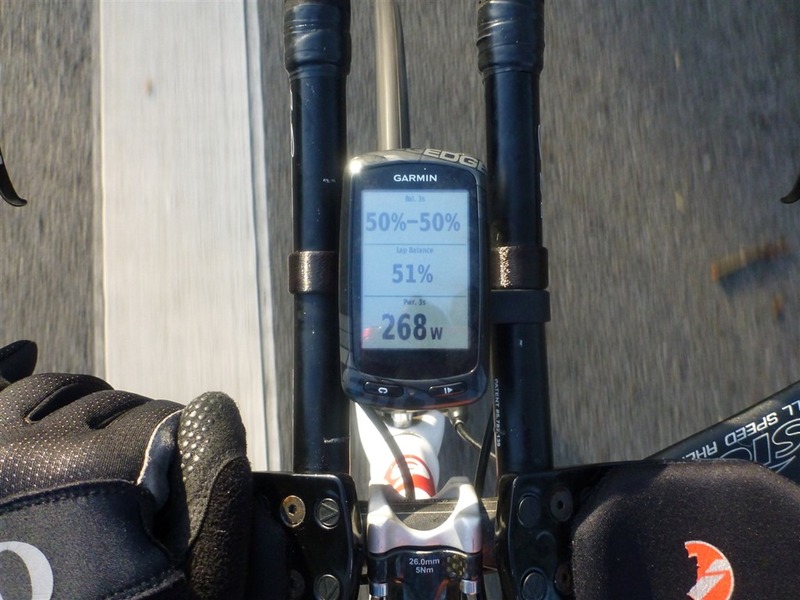 One thing to note, though – our power meters don’t require back pedaling to zero. Please just coast (not moving the pedals, no tension on the chain) for about 5 seconds and the unit will have zeroed. What is the difference between the type S model vs the other. I can find no information on this on your web site. How often does the Power2max send data? 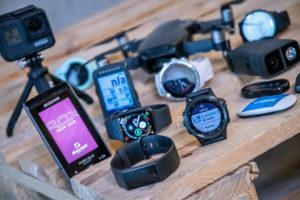 Garmin only records once per second, but the upcoming SRM unit should work with third party meters and record 4hz, would P2M send data that often and would there be any use for it if it did? The problem is that the upcoming unit doesn’t change though the recording rate of the Garmin devices, which is still 1hz. That said, most power meters actually send more frequently than that. When I do testing, the devices I’m using capture all those packets, and generally speaking it’s up to 4hz for most on the market. Ultimately, unless you’re doing track-start type analysis, there’s not yet a lot of proven benefit in it. Further, some head units average those values anyways (for example, the 4hz). Okay, so if you are doing track-start analysis, and power data generated through a 500 m or kilo time trial, which power device is most appropriate? Garmin vector, power2max, powertap, srm, or perhaps something else… and what is the best way to capture this data? It depends on what you’re overall plan/process is. SRM captures at a higher rate, as does Pioneer. Also, PowerTap just announced a product two (see my post from two weeks ago on it). Stages does some super-high resolution capture far beyond anyone else today…but you sacrifice a lot going with left-only in that situation. So much so that I think you’re not getting a truly accurate picture in a track-start scenario. But at the same time you’ll need to ensure you’re having the right software to analyze it. Unfortunately, it’s not quite an area I’ve dug into too much – though most doing track start analysis are using SRM. If I used the P2M power meter with Wahoo’s RFLKT+ and an iphone, will I be able to calibrate the PM with this setup? IM not sure if this issue has ben touched in comments above, but the batteryissue that States it has to be a certain brand of battery is not true. 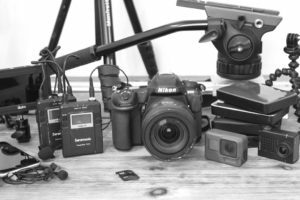 I have used both Panasonic, and other brands. However there has been ONE issue which Was the thickness of the battery. Ive had to bend the ‘Poles’ in the batterycompartment to get a proper connection to the battery When changing it.. After that, no problems. Nicolas from power2max here. What you are describing is exactly why we advise STRONGLY against it. You may damage the little plastic holders for the battery and this will not be covered by battery. Please ONLY use Renata batteries on the Classic. So helpful – especially for a very non techy … female! Understood everything I needed to – except one thing.. you note the price point without cranks and compare it to the Garmin vector with cranks. How much are new cranks as in your photo? Vector doesn’t come with cranks, it comes with pedals (well, as pedals). Most bikes already have cranks, and that’s a key selling point of Vector, that it works with the vast majority of existing cranks (especially the new larger pods). As of today(?) there is a 150 US/euro price cut! 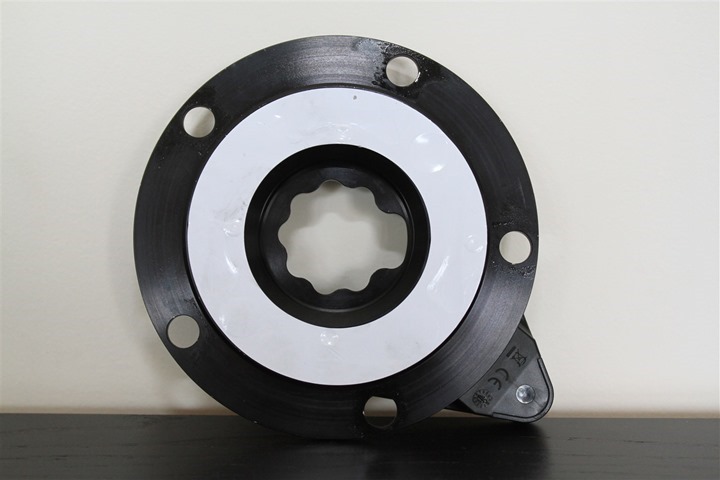 I’m in the process of researching this unit for install on a tt bike with rotor q rings – 53/39 BB 130. My mechanic is not certain that the unit will work will with the q rings. Have there been any issues with using this meter with the oval rings? I’m thinking not, but the mechanic I use is familiar with every make and model of power meter on the market. sorry for the late reply – we were at Eurobike last week, so little internet time. Q-Rings in 130 are no problem at all. In 110 the Classic has a restriction, but not in 130. Has anyone here managed to have the garmin edge 510 pair with the power2max built-in ANT+ cadence sensor? the cadence function gets transmitted by simply pairing the power meter. There is no separate pairing for the cadence function. If you have another cadence sensor, like a combo speed/cadence, your Garmin will prioritize it above the Power2Max one. I have a Power2max and edge 510 and have never had any issue. 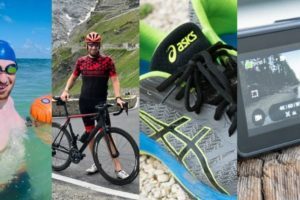 Both of the above comments are true–you only pair the power meter, not cadence and power individually, and any separate cadence sensor will have priority. Problem with Garmin 510 calibration. Guys please, does anybody have advisement for me? I used P2max for more than 6 months with my Garmin 510 without any problems. And than one day I did a calibration and it wasn’t correct. It showed calibration 3 error or calibration error 3. I tried diferent P2max today and have the same problem. It shows watts over that calibration errors. I compared watts with Cyclus 2 and P2max shows arround 7% lower watts then Cyclus2 (400watts on Cyclus2 versus aprox 380watts on P2max). Do you think, that it is Ok and it doesn’t matter, that calibration still shows error 3 or not? Sorry for my English and thanks for any advisement. calibration error 3 is displayed if the cranks are still moving whilst you are trying to calibrate. You haven’t waited long enough to do the manual calibration. If you had tension of the chain when you did the manual calibration you may have recorded a wrong zero offset, leading to lower readings on your power2max. thanks for your reply, it was helpful. Today I did the manual calibration and it was done correctly. But I think that the number of watts from P2M was to low on today training. Does temperature have an impact on watts? I mean low temperature under zero (-1°C/30°F). The temperature was constant during the whole training. I did several calibrations and the difference among numbers was more than 20 (I think the highest was 611 and lowest 587). I don´t know if I have P2M with temperature compensation (garmin showed firmware 0.60). Can be this difference among calibration numbers problem? Or the problem is low temperature? Thanks for your reply. the temperature doesn’t affect the measurement, because the zero offset gets automatically calibrated (or manually, in your case). the fact that the zero offset moved during the training is normal: when you started your power meter was still warm from being in a warmer place, and it takes a while until it has taken the temperature of the environment. What the temperature compensation do is adjust the zero offset along the temperature curve whilst you pedal, as the temperature of the power meter changes. As of now, I cannot find any video for step-by-step instructions to change out my Type-S unit’s battery, and I at least know you unfortunately need to take off the spider and chain ring from the crank arm (meaning I need to buy extensive tools). Too bad I need to travel to my dealership to get this done, unlike the earlier units. That’s a bummer–I’m not looking forward to my battery dying either then. This seems like a design fail. I can replace my Quarq battery in about 10 seconds. you can change the battery with the cranks in place on many frames. On some frames with particularly big bottom brackets the cranks need to be taken off. The chain rings never need to be removed. The reason for the design is to protect the power meter from overtightened screws – worst case the cover will be damaged, which is cheap to replace. I am interested in the p2m classic but would like to use my crank. Great review as always! I am really considering purchasing the power2max but am absolutely clueless with regards to bottom bracket compatibility and of the actual bottom bracket I have. 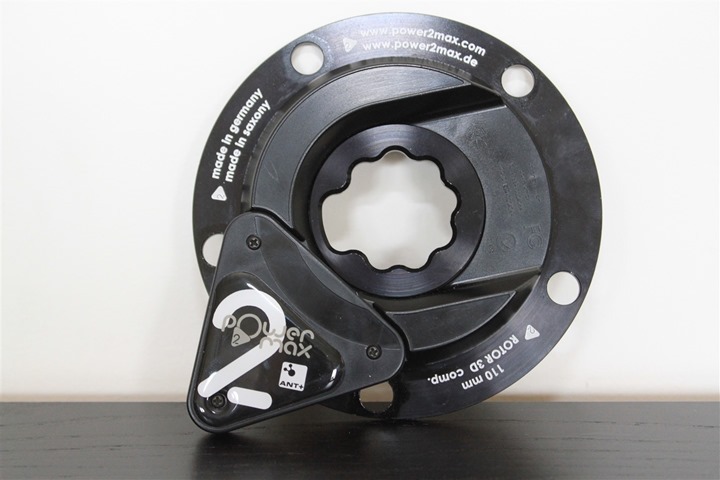 If anyone can help out here I’d be greatly appreciative as I’ve spent the past few days trying researching bottom brackets that I think i’ve gone full circle…. 2010 Specialiazed Roubaix Comp – Shimano 105 groupset with cranks of Sm FC-5600. I’m running compact 50-34 with 170mm cranks. On the bottom bracket, it appears bearings are outboard/external. Here are specifications: BC 1.37×24. Now am I correct to assume this means I have a BSA 68 bottom bracket standard? If so, would that therefore mean the appropriate power2max options are FSA Gossamer, FSA K-Force Light, and Rotor 3D? I hope i’m correct so far as I’m leaning towards the FSA Gossamer, with cranks of 170mm and version 110mm compact. Would it also be in my best interest to purchase the FSA megaexo BSA68 bottom bracket and 50-34 chainring, too? No problems with either if it ‘completes the package’ and streamlines everything so that assembly and functionality aren’t compromised. Thanks again for any help/advice! Stephen Tyson – Just send them an email. They responded quickly and answered all my bottom bracket questions. You should have the BSA 68 on that bike. Same as on mine. Even better. Power2Max just lowered their price on some of their models. For my Cervelo P2 I just bought the power2max Classic FSA Gossamer power meter and cranks for $599! My experience with the purchase was very good and installing them was super easy (seriously I’ve never done any major work and replacing the cranks took me about 30 minutes.) I love the fact that you don’t have to tinker with anything. Just install and go. I can use any pedals I want. I weighed my old crank and the new one and the Power2Max added only 186 grams! I have about 300 miles on so far and everything is working fine. Quick note on the weight difference. I weighed them with the chainrings on and I have a new set of chainrings so I’m not sure how that contributed to the weight being either higher or lower or the same. Either way – it’s not much. I have the Classic FSA Gossamer and have had it since Nov 14 and love it. However, I think (not sure if its my mind playing tricks) the info has got slower on appearing on my Garmin. When I first started using it there was about a 0.5 -1 sec delay, now it appear to be about 2 sec’s. Has anyone else noticed this or is it just my mind playing tricks?? Have changed battery etc but don’t really want to send it back to P2M at the moment. I made the mistake of trusting a retailer who poorly installed FSA crankset and a power2max. It is now impossible to get the crank out. do you have an idea how to do this? Question for Nicholas. I just send this message via the P2M website, but you might be able to help. Attached yesterdays power. Message: Hi – I have what I believe is a 1st generation P2Max. Shipped to me in April 2012. (In 2013, I got the temperature drift compensation). I use it with a Garmin 910XT. Things have been fine all along, but last week the power went wacky. It was not reading at all and then started going into the thousands during a session. I tried replacing the battery. I use the calibration feature and recently it started giving me “Error 4” after which I do not get readings and the Garmin shows “–“. It will go to 0W if I do not pedal for 30” but then goes back to “–“. Strangely the cadence seems to work all the time, but the power goes in and out or is off by a factor of 10 or greater. Yesterday I was racing. It calibrated fine at the start and work for about half the bike leg. After a turn around point where I stopped pedaling it started going into the thousands and never came back. Today I got the calibration error again even after putting in another new battery. I even tried using another Garmin watch in case it was the Garmin, but got the same error. I have tried searching for solutions on the internet, but there is not much out there. Maybe that is a good sign, that they do not fail often! My matter is slightly urgent as I have Ironman Austria on the 26th June!! Can you help? Thanks for your immediate attention. Did you find a resolution to your problem? Hi – I have what I believe is a 1st generation P2Max. Shipped to me in April 2012. (In 2013, I got the temperature drift compensation). I use it with a Garmin 910XT. Things have been fine all along, but last week the power went wacky. It was not reading at all and then started going into the thousands during a session. I tried replacing the battery. I use the calibration feature and recently it started giving me “Error 4” after which I do not get readings and the Garmin shows “–“. It will go to 0W if I do not pedal for 30” but then goes back to “–“. Strangely the cadence seems to work all the time, but the power goes in and out or is off by a factor of 10 or greater. Yesterday I was racing. It calibrated fine at the start and work for about half the bike leg. After a turn around point where I stopped pedaling it started going into the thousands and never came back. Today I got the calibration error again even after putting in another new battery. I even tried using another Garmin watch in case it was the Garmin, but got the same error. Ash – Those are all the same symptoms that I had. I sent it to P2M. I checked for any cracks on the meter before sending it and I did not find any. They sent back pictures of it with cracks. Did I miss them? Not sure. I really had no come back. I ended up buying a new one (gen 2) off them. They gave me a discount on the new one. In fact I bought two. Before I got any news back from P2M, I ended up borrowing a friends meter just before my IM. The same thing happened with the one I borrowed. It went all whacky during the race. Not ideal. Should never of even borrowed it. Did just over 5hr for the bike split. I’m sure I would have gone under 5 had I not been worrying about the stupid power meter on the day. They did write to me at one point and tell me that the expected life span of the power meters was only 5-7 years. I thought that was pretty bogus. Mine and my friends was about 5 years old. Another friend of ours that bought his at the same time, had his go about 6 months prior. They gave him a gen2 for nothing. So this 5-7 year thing was stacking up. I think this was down to the design. I think the gen2 design is better. The meter is more robust. I suspect that the gen1 was vulnerable where the battery was. It was slightly cantilevered, thus it was easy to put stress on it when changing the battery. I was changing the battery every year. The gen2 seems more robust. I am looking to purchase a used power2max rotor 3D. How can I tell the difference between a gen 1 and gen 2 ? 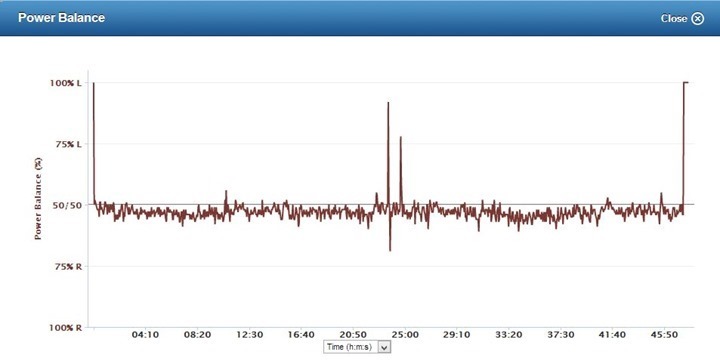 I’m using a power2max ng meter combined with a wahoo elemnt bike computer and I would like to know with which software you can view data on pedaling metrics offline (balance left / right, uniformity of pedaling etc …) with golden cheetah no I can see these kind of information, the same thing with premium strava. and I am trying to do this myself now with this exact power meter. Very tight but before I really go at it would like to double check (if you still remember) that anti-clockwise is loosening ? Hi I might be 6 years out of date but just read your great review of this product. I’ve just bought one of these units off eBay and trying to work out if it’s got the temperature adjuster built into mine? Any advice as to how to work out if 1st or 2nd generation. Keep up the great reviews you’ve really helped with so many of my purchases.